© 2002, © 2018 by Paul Freeman. Revised 11/1/18. A 1935 photo of an Aeronca "Flying Bathtub" at Madeira Field with members of the Goodwill Air Service & Flying School. allowed pilots to land on his property near Kutztown Road & the road that later became the 5th Street Highway. Over time, the landing site grew in popularity, with pilots building hangars & improving the 2 grass runways. It became known as Madeira Field. said John Cianci, a Muhlenberg resident who has studied Berks County's early flying days. 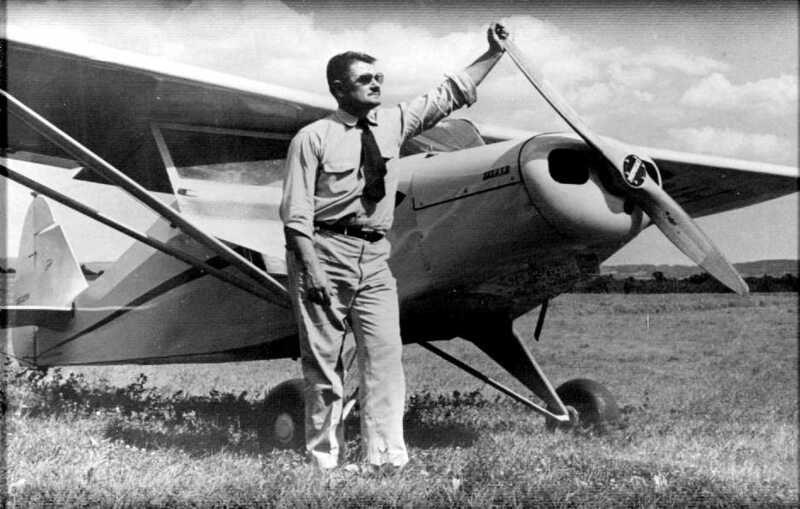 The Reading Aero Club used the field as its base of operations for a time, and many pilots got their start in flying at Madeira, Cianci said. was a 1935 photo of an Aeronca "Flying Bathtub" with members of the Goodwill Air Service & Flying School. According to the 1939 dedication program of Reading Airport, “Madeira Flying Field was host to many visiting airmen. After a number of years the field was enlarged, hangars were erected & other improvements carried out. Madeira Field ceased being just a barnstormer’s haven & became a commercial port for chartered flights & student instruction. depicted Madeira Flying Field as being an L-shaped grass field with a few small buildings on the southwest & southeast sides. was on the May 1943 NY Sectional Chart (courtesy of Michael Floriani). as a 42 acre L-shaped property having an all-way sod landing area measuring 2,000' east/west. The field was said to have 6 wood & metal hangars, the largest measuring 76' x 40'. Madeira was described as being owned & operated by private interests. "This went from birth to death just like the Kutztown Airport," said Robert Compton, who also has studied local aviation. 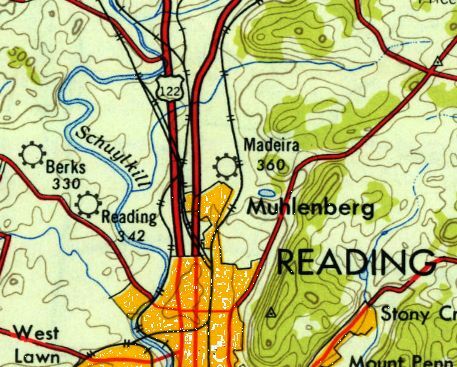 The last depiction which has been located of Madeira Field was on the 1949 USGS topo map. According to the article in the 5/7/09 Reading Eagle, “In 1967, Madeira Field was sold, and the land became a strip mall. According to the article in the 5/7/09 Reading Eagle, “Nowadays, the commercial strip that extends from Kmart to the Redner's Warehouse Market was once a hub of aviation. That grass field is long gone. Hangars are just a memory, and there's no hint that small planes ever buzzed the skies over Muhlenberg. 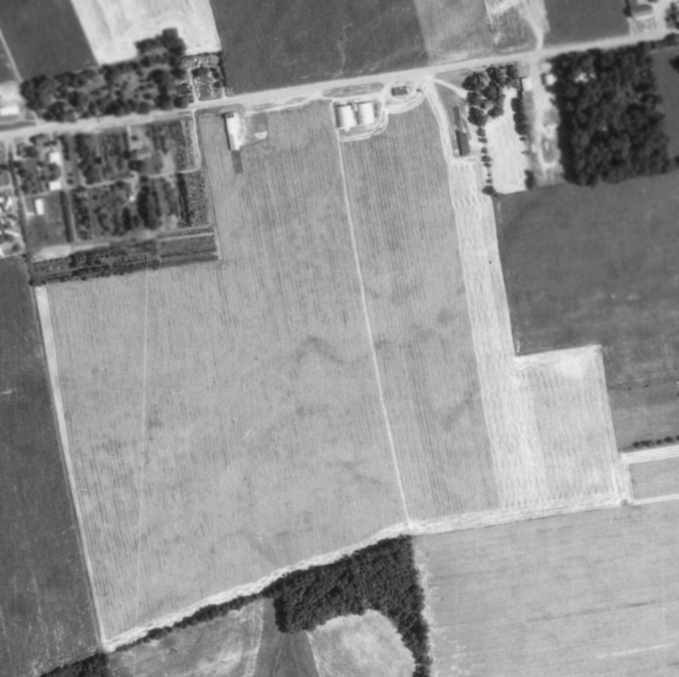 A 2015 aerial view showed no trace remaining of Madeira Field. The site of Madeira Field is located northeast of the intersection of Route 222 & George Street. 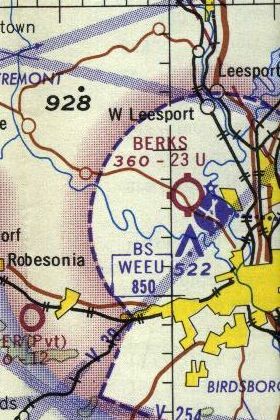 Berks Airport, as depicted on the May 1943 NY Sectional Chart (courtesy of Michael Floriani). was laid out by a group of local flyers” in 1938. 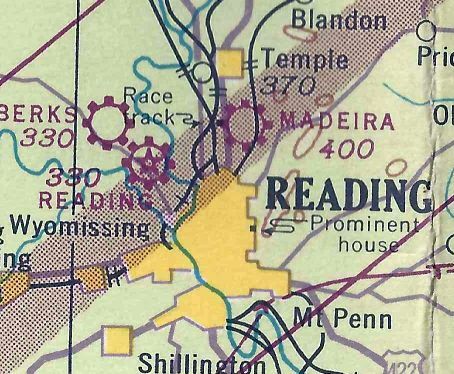 Note the odd proximity of the larger Reading Airport, less than a half-mile to the southeast. 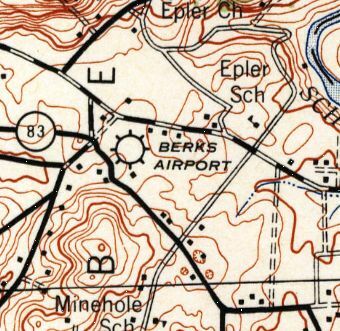 The 1944 USGS topo map depicted Berks Airport as having several buildings along the north side. as a 47 acre irregularly-shaped property having an all-way sod landing area measuring 1,800' east/west. The field was said to have 5 hangars, the largest measuring 70' x 35'. Berks Airport was described as being owned & operated by private interests. 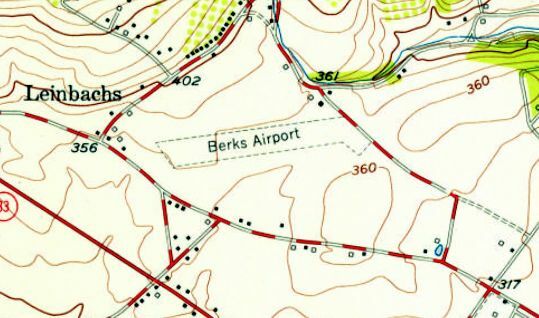 Berks Airport, as depicted on the 1949 USGS topo map. with 3 small buildings along the northeast side. 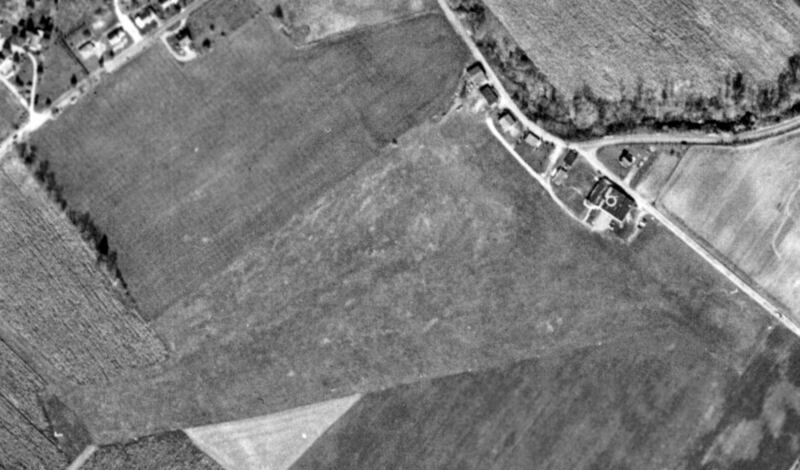 The earliest photo to be located of Berks Airport was a 10/31/58 USGS aerial view. there were no aircraft visible on the field or other indication of recent aviation use. 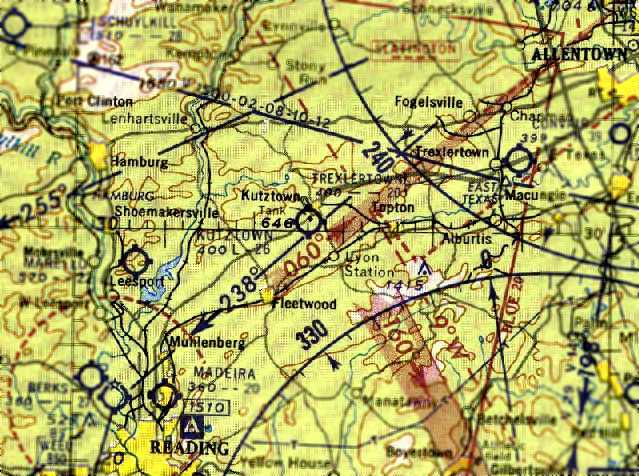 The last aeronautical chart depiction which has been located of Berks Airport was on the 1967 NY Sectional Chart. It depicted Berks as having a 2,300' unpaved runway. as it was no longer depicted on the 1975 NY Sectional Chart (courtesy of Mike Keefe). with 2 more recent additions built onto its southern & western sides. 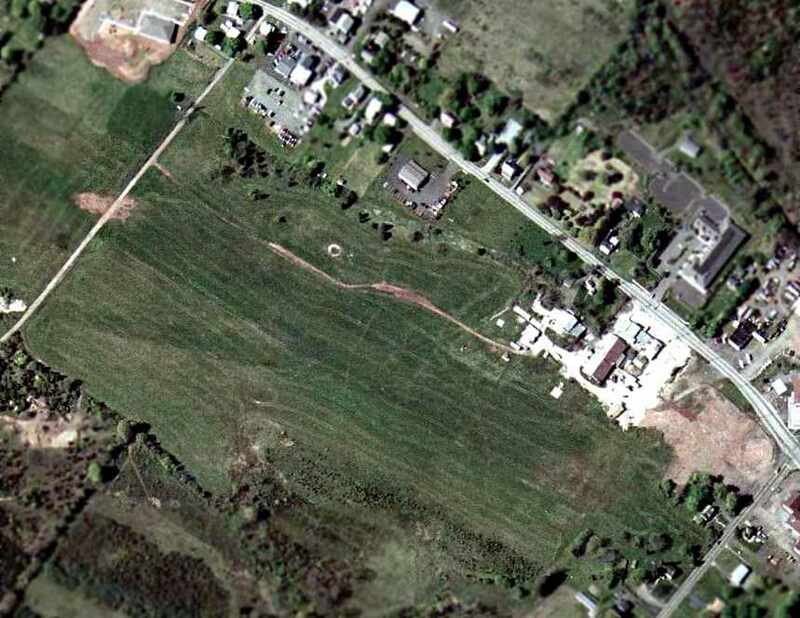 A 2013 aerial view showed that the majority of the Berks Airport runway site remained clear, and one former hangar remained standing on the northeast side of the property. As of 2015, street maps labeled the former Berks Airport hangar as the facility of Malsnee Tile & Stone. The site of Berks Airport is located west of the intersection of Stinson Drive & Old Airport Road, appropriately enough. Smiling Jack Airport, as depicted on the May 1943 NY Sectional Chart (courtesy of Michael Floriani). This short-lived little general aviation airport was “established in August 1942” (according to an article courtesy of Benjamin Swearingen). That would prove to be very unfortunate timing, as many small civilian airports near the coasts were eventually closed during WW2. 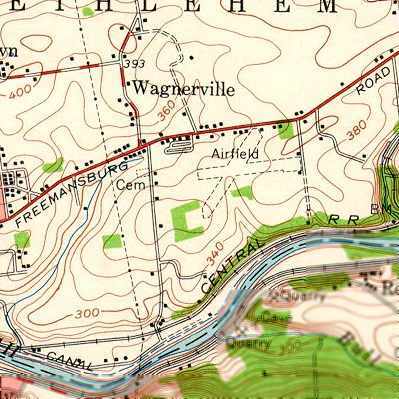 The article said the airport was “on the farm of William Schmale, bounded by [Airport] road & Route 422. Smiling Jack Airport was opened on 9/9/42 (according to a newspaper article courtesy of Benjamin Swearingen). Smiling Jack Airport was evidently named after the popular aviation-themed comic strip of the 1940s. “There were about 20 light aicraft kept at this airport along with a shop & hangar for 6 planes” (according to an article courtesy of Benjamin Swearingen). 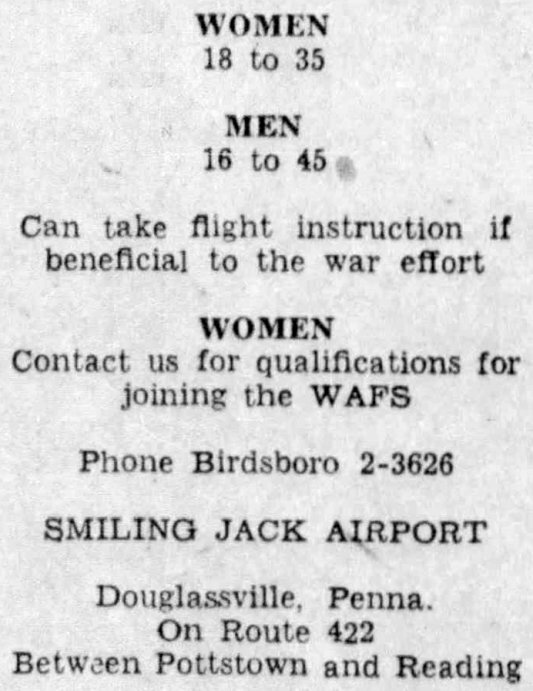 A circa 1942-45 advertisement for flight instruction beneficial to the war effort offered at Smiling Jack Airport (courtesy of Benjamin Swearingen). It depicted Smilin' Jack Airport as having 2 or 3 grass runways. as a 60 acre triangular property having an all-way sod landing area measuring 2,400' northeast/southwest. The field was said to have 2 metal & wood hangars, the largest measuring 90' x 42'. Smilin' Jack Airport was described as being owned & operated by private interests. The last aeronautical chart depiction which has been located of Smiling Jack Airport was on the January 1945 NY Sectional Chart (courtesy of Ron Plante). which was odd timing – it seemingly missed out on the post-WW2 boom in U.S. general aviation. 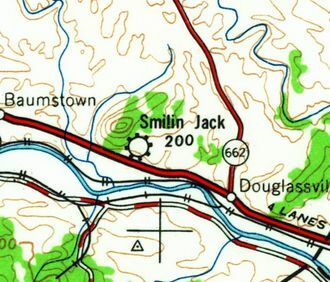 The 1949 USGS topo map depicted Smilin Jack as a commercial/municipal airport. Smiling Jack Airport was no longer depicted on the July 1949 NY Sectional Chart (courtesy of Ron Plante). 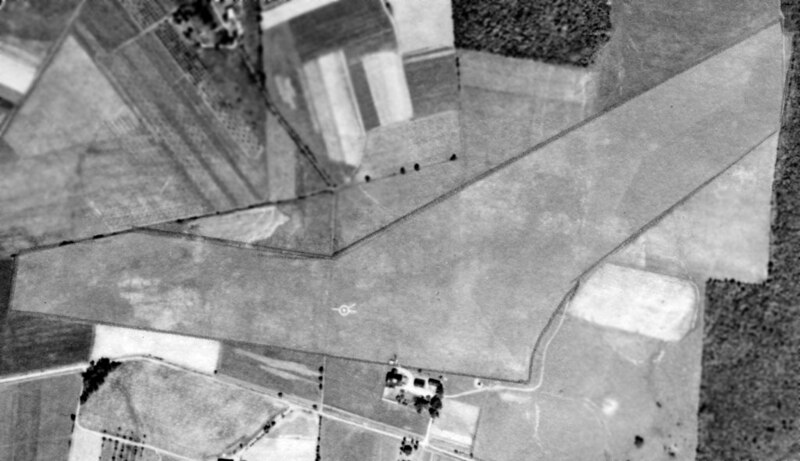 A 10/16/58 aerial view (from Penn Pilot) showed the runways of Smiling Jack Airport to remain clear. 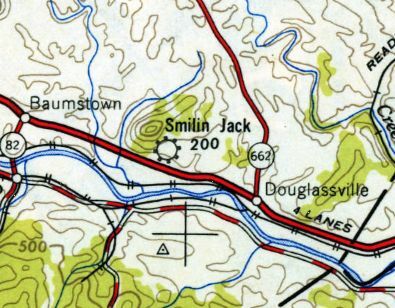 Smiling Jack Airport was still depicted on the 1964 USGS topo map, even though it had evidently been closed for 18 years by that point. 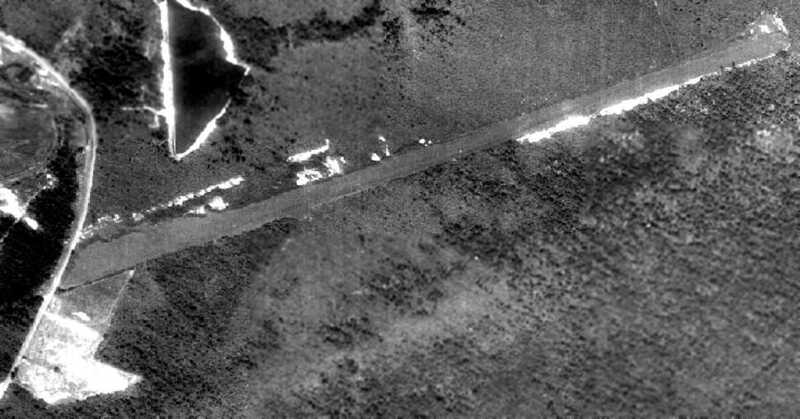 A 1968 aerial photo showed that houses had been built along the east edge of the Smiling Jack Airport property. 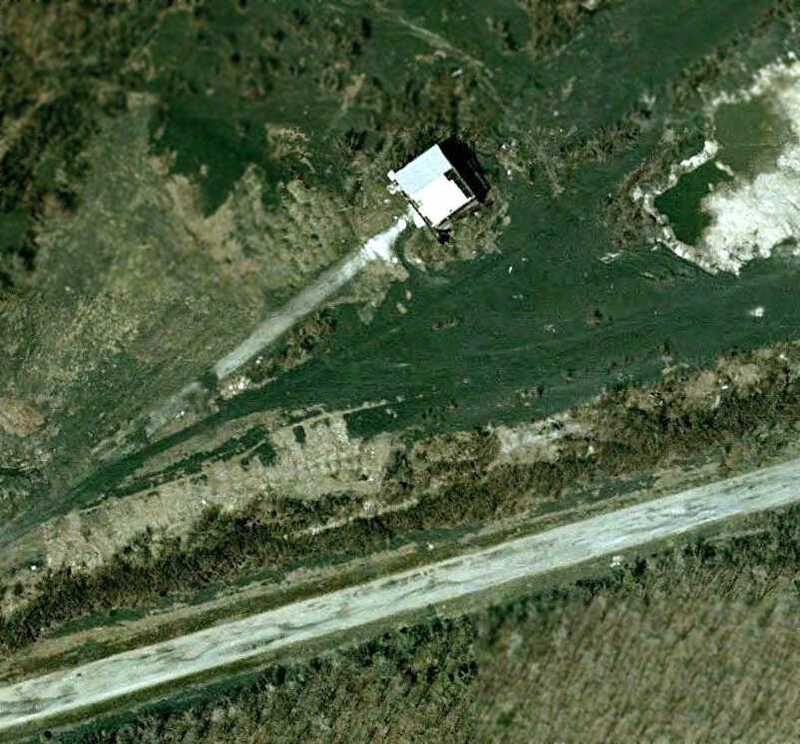 A 1992 aerial photo showed that the majority of the Smiling Jack Airport property was still clear. 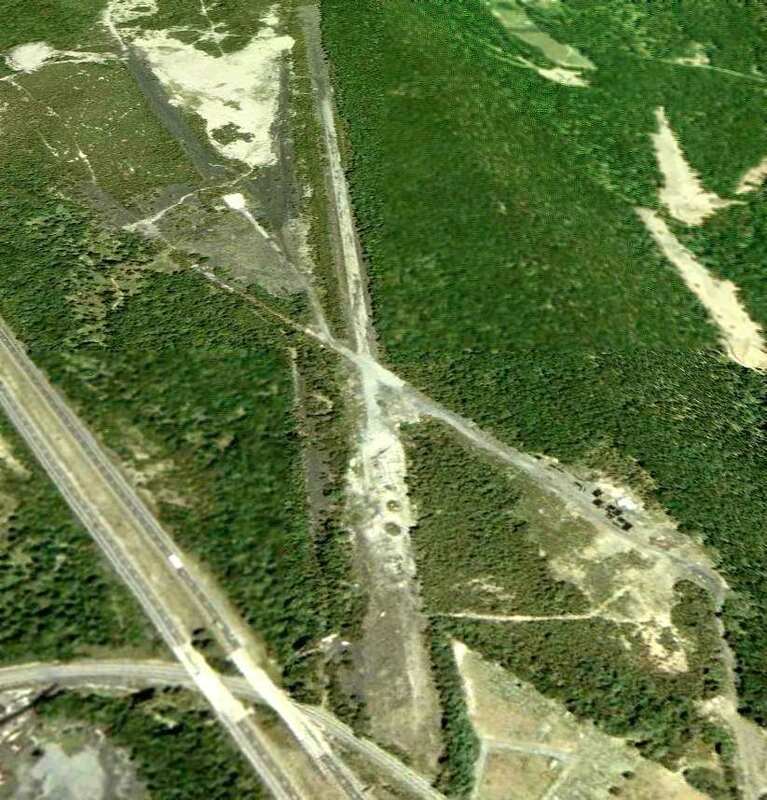 A 1998 aerial photo showed that houses had been built over the remainder of the Smiling Jack Airport property at some point between 1992-98. A 2013 aerial view showed no recognizable trace remaining of Smiling Jack Airport. The site of Smiling Jack Airport is located northwest of the intersection of Route 422 & Old Airport Road, appropriately enough. Thanks to Michael Floriani for pointing out this airfield. A 9/25/38 aerial view of Barnesville Airport (from Penn Pilot). The earliest depiction which has been located of Barnesville Airport was a 9/25/38 aerial view (from Penn Pilot). 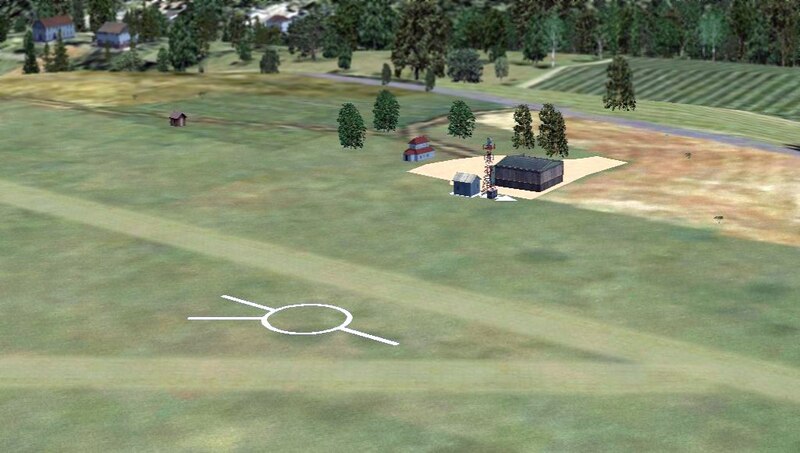 It depicted Barnesville as having 2 grass runways, with a very distinct airport circle & runway indicator in the center. but there were no aircraft visible on the field. 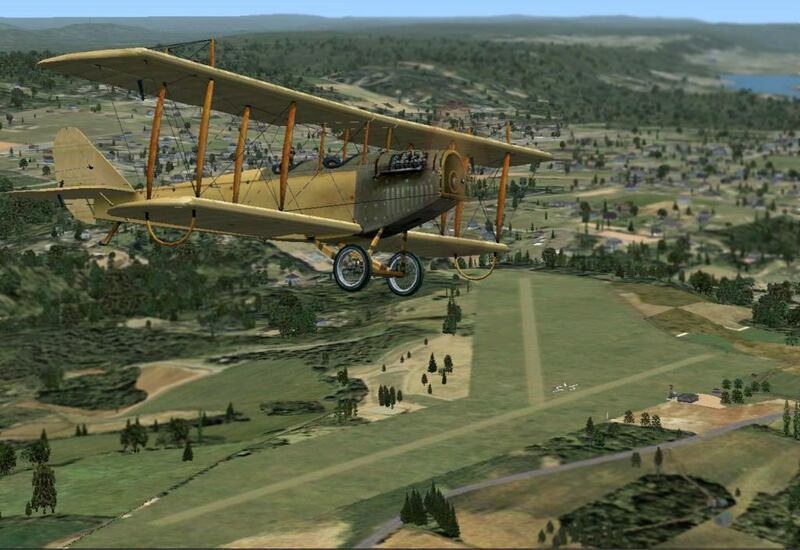 A flight simulation scenery depiction by Richard Finley looking northeast at a JN-4 Jenny overflying Barnesville Airport. showing the airport circle marking, the beacon light tower, hangar, and other buildings. The earliest aeronautical chart depiction which has been located of Barnesville Airport was on the November 1942 NY Sectional Chart (courtesy of Ron Plante). It depicted Barnesville as Commerce Department Site 61B. The last aeronautical chart depiction which has been located of Barnesville Airport was on the January 1945 NY Sectional Chart (courtesy of Ron Plante). as was depicted on the 1949 NY Sectional Chart. 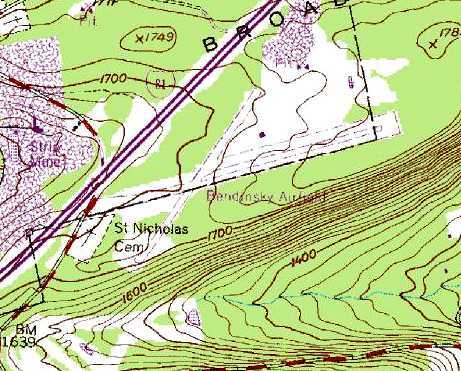 The last depiction which has been located of Barnesville was on the 1949 USGS topo map. It depicted Barnesville Landing Field as an irregularly-shaped outline, with a beacon and 2 small buildings on the south side. 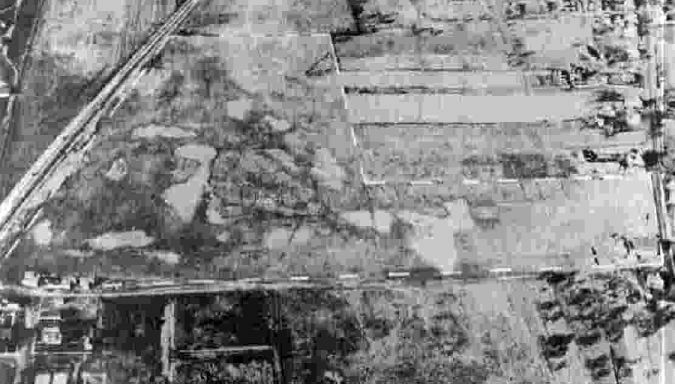 A 1958 aerial view (from Penn Pilot) showed that the site of Barnesville Airport had been returned to agriculture. 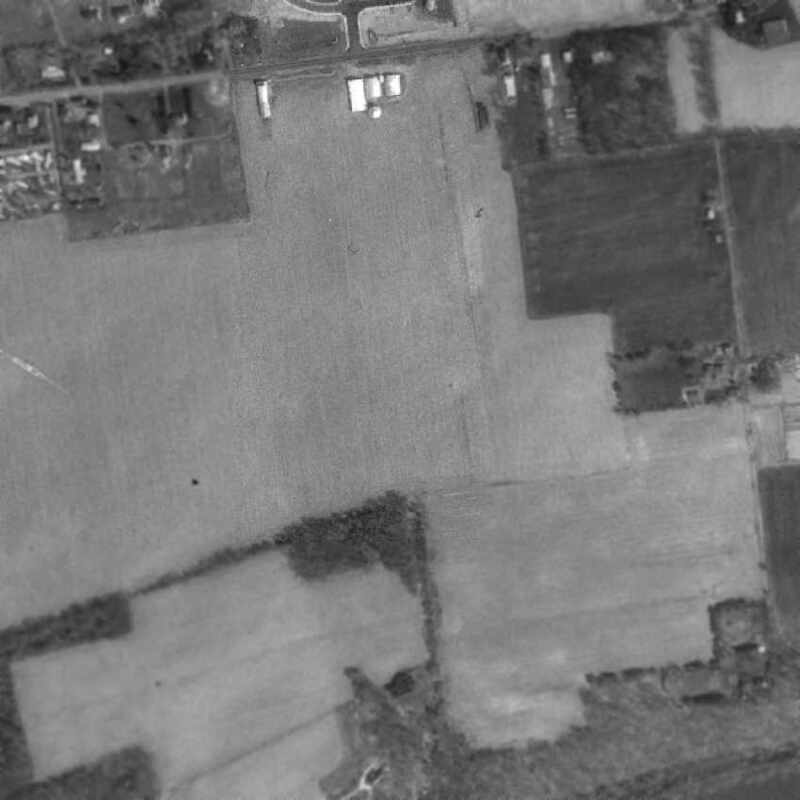 A circa 2010 aerial view showed that relatively modern houses occupied the site of the Barnesville Airport buildings. 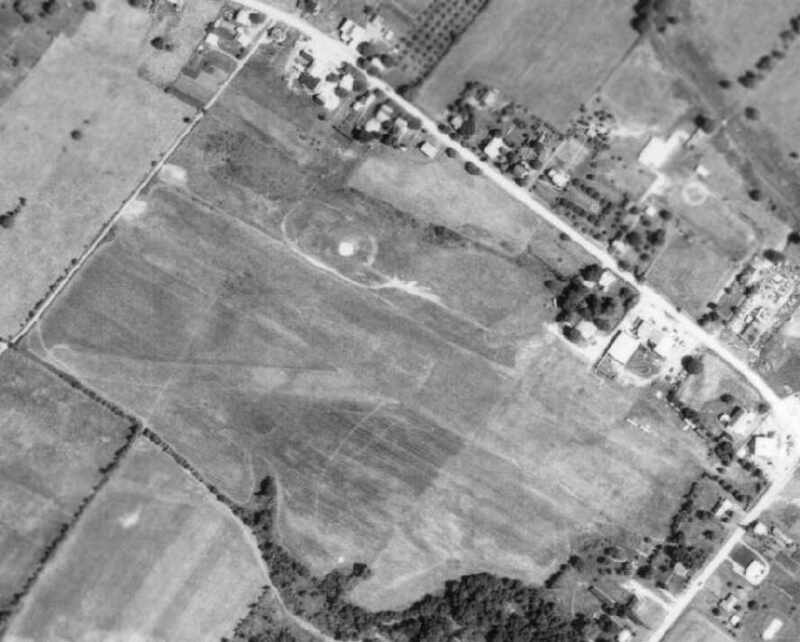 Amazingly a 9/12/12 aerial view showed that the outline of the Barnesville Airport runways remained recognizable after having been abandoned for roughly 70 years. The site of Barnesville Airport is located northeast of the intersection of Tuscarora Park Road & Route 1018. 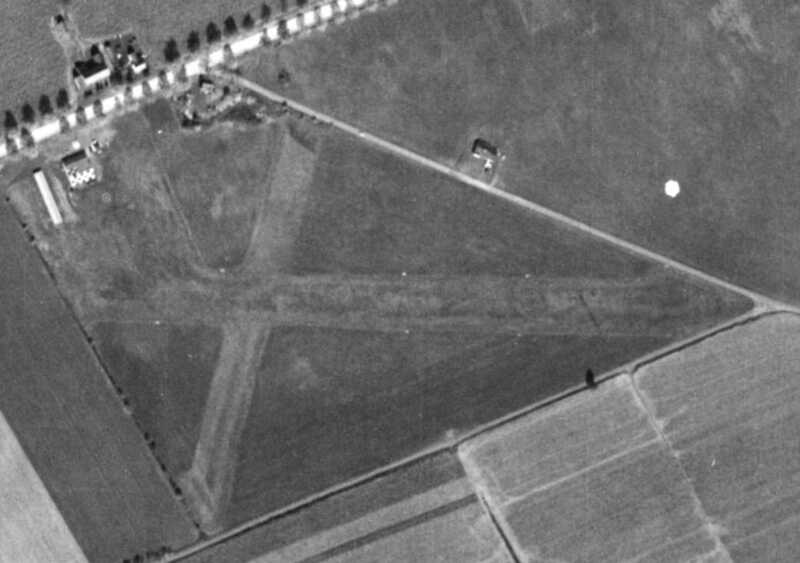 Thanks to Richard Finley for pointing out this airfield. 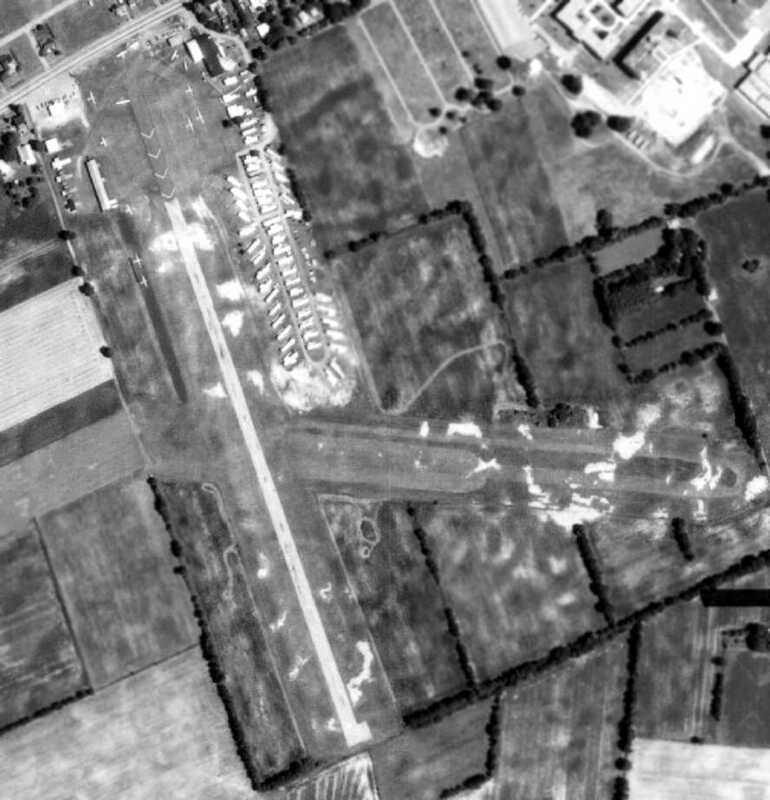 An 8/27/58 aerial view of Bedinsky Airfield (from Penn Pilot). as it was not yet depicted on the 1954 USGS topo map, nor depicted on the 1958 NY Sectional Chart. 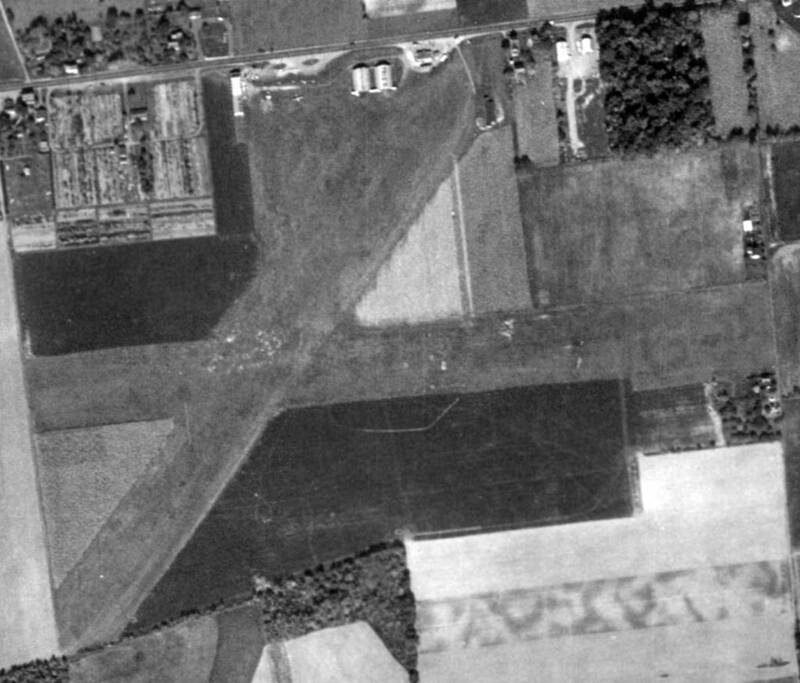 The earliest depiction of Bedinsky Airfield which has been located was an 8/27/58 aerial view (from Penn Pilot). It depicted Bedinsky as consisting of a single paved northeast/southeast runway. There were not any buildings at the site, but there was a clearing on the southwest side. 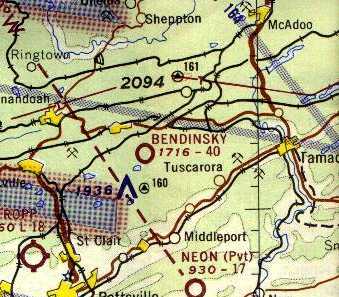 The earliest aeronautical chart depiction of Bedinsky Airfield which has been located was on the 1965 NY Sectional Chart. It depicted Bedinsky as a private airfield with a 4,000' unpaved runway. Note that Interstate 81 did not yet exist. 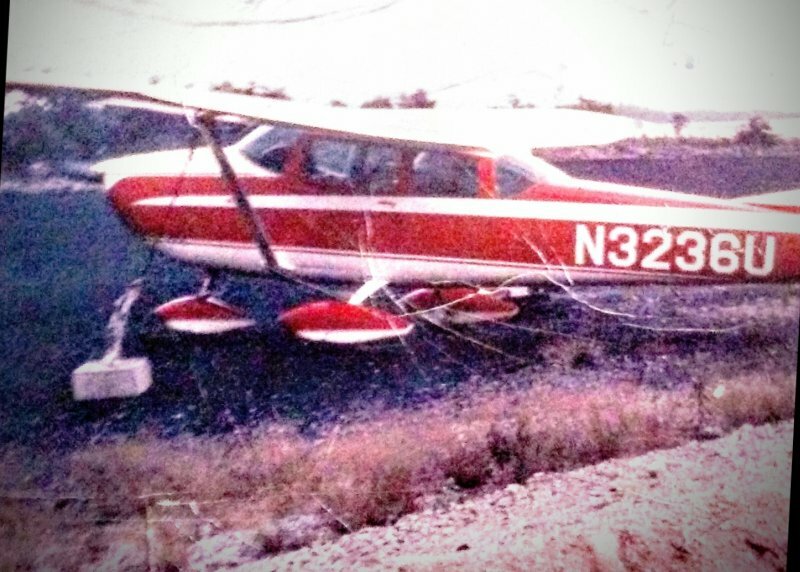 The only photo which has been located of an aircraft at Bedinsky Airport was a 1966 photo by Ed Trusky of N3236U, his father's 1963 Cessna 182F, in which he learned to fly. The 1967 NY Sectional Chart (courtesy of Mike Keefe) continued to depict Bedinsky as a private airfield with a 4,000' unpaved runway. Interestingly, it showed that the still-under-construction Interstate 81 had its southwestern terminus right next to the airfield. as having 2 unpaved runways, with a single small building to the northeast of the runway intersection. but one of them subsequently had a hangar situated over it. The last photo which has been located of the Bedinsky hangar was a 4/1/04 aerial view. Although still standing, it appeared to be missing roof panels. The Bedinsky hangar was removed within the next year, as it was no longer depicted in a 5/10/05 aerial photo. A circa 2005-2011 aerial view looking east at the remains of Bedinsky Airfield. A 5/28/08 aerial view looking east at the remains of Bedinsky Airfield. as it was no longer listed among active airfields as of 2011. A 5/11/14 photo by Michael Dunsavage of the Bedinsky Airfield runway intersection. 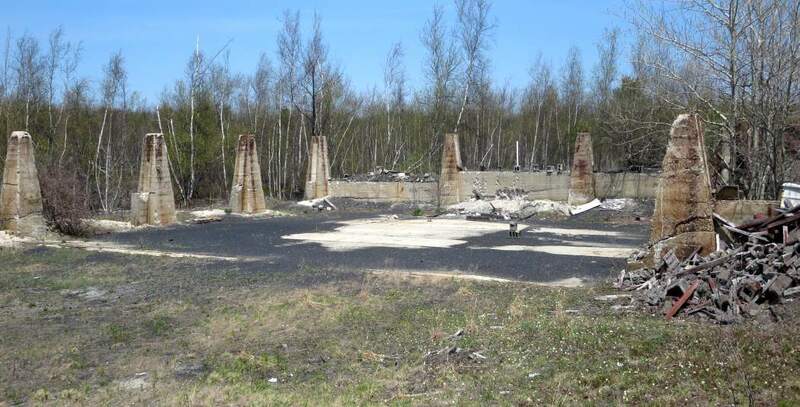 A 5/11/14 photo by Michael Dunsavage of the remains of the Bedinsky Airfield hangar. 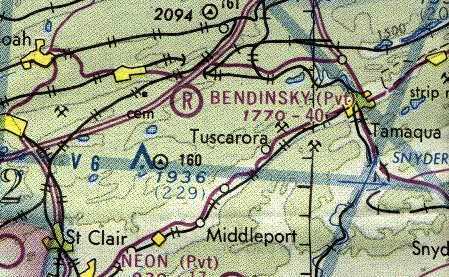 The site of Bedinsky Airfield is located east of the intersection of Interstate 81 & Burma Road. Thanks to Gary Bopp for pointing out this airfield. A circa 1945-46 picture of the construction of the Trexlertown Airport hangar (courtesy of Elwood Christ). Elwood Christ recalled, “Either late 1944 or early 1945, my parents [started] an airport at Fogelsville. After no more than a year, my father discovered a better site for an airport a mile east of the main intersection of Routes 222 & 100 near the center of Trexlertown. On a 42-acre tract, my father started the process of converting farm land into a grass-covered airfield. he also had to chop down small trees that grew along the western property line at what became the west end of the main runway. was a circa 1945-46 picture of the construction of the Trexlertown Airport hangar (courtesy of Elwood Christ). Elwood recalled, “I estimate that this image was taken from a spot about 20' south of Route 222 looking southwest. As seen here, the north wall of the hangar has been completed with installed windows (they had metal frames). To the left behind & the front half of the car, rises the east wall of what would become the first office / ground school classroom / residence. The 2 men standing above & behind the car actually are leaning on part of the hangar’s south wall that rises only half its finished height. Elwood reported that his father “established Christ’s Aviation Service. The Trexlertown Airport had 2 runways. The main one ran west-northwest to east-southeast, the minor runway ran north-northeast to south-southwest. The areas off the runways was leased out to local farmers who planted alfalfa. Apparently the hangar was a checkerboard [roof] possibly as early as its construction about 1946. I have fond memories of the Trexlertown Airport, and can remember flying with my Dad to Braden Field at Easton & the Kutztown Airport. Some of our longer trips were to Asbury Park, New Jersey, and to Montauk Point at the tip of Long Island. 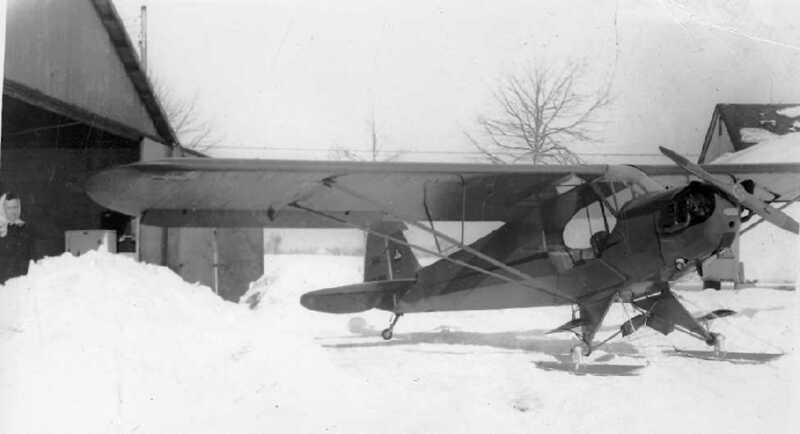 A circa 1947-48 photo of a Piper J-3 Cub on skis at Trexlertown Airport (courtesy of Elwood Christ). past the snack bar (right edge) toward the old bank barn on the north side of Route 222. The tall trees in the background stand on either side of Route 222. Sarah Christ can be seen at the left edge of the picture. 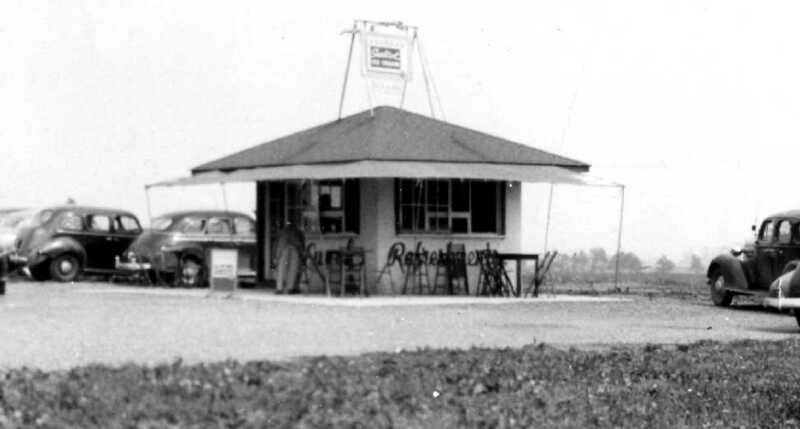 A circa 1947-50 photo of the Trexlertown Airport Restaurant / Snack Bar (courtesy of Elwood Christ). Elwood observed, “This view looks southeast from a point about 20 or so feet south of Route 222. The hangar is located off the right edge of this image. The earliest aeronautical chart depiction which has been located of Trexlertown Airport was on the July 1949 NY Sectional Chart (courtesy of Ron Plante). It depicted Trexlertown Airport as having a 2,000' unpaved runway. A circa 1950-54 photo of “Warren Christ, Aviator”, at Trexlertown Airport in front of a Piper Clipper (courtesy of Elwood Christ). Elwood related, “This is my favorite photograph of Pop. so he built an automotive garage onto the hangar where he established a Gulf Gasoline franchise. About 1950-1955 or so, a one-story, concrete-block, side-gabled garage building was constructed onto the entire length of hangar’s north wall. The left window opening, then, was turned into a doorway. The level of the garage office area was almost about a foot higher than the hangar’s floor. The gas pumps were installed just off the right edge of the image. 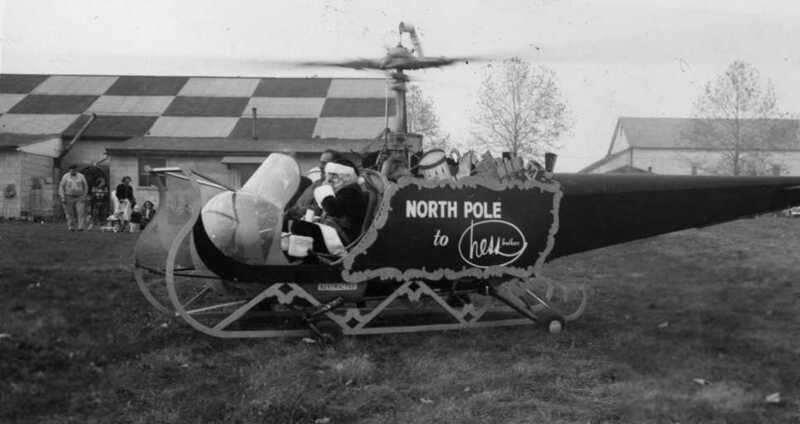 A December 1953 photo (courtesy of Elwood Christ) of Santa being flown on a Bell 47 helicopter elaborately modified into his “sleigh”, seen at Trexlertown Airport. Trexlertown's checkerboard-roofed hangar was visible in the background. Elwood recalled, “I suspect this image was taken Christmas 1953, for my mother, brother & I can be seen in the background. The image was taken south of the main hangar looking north. 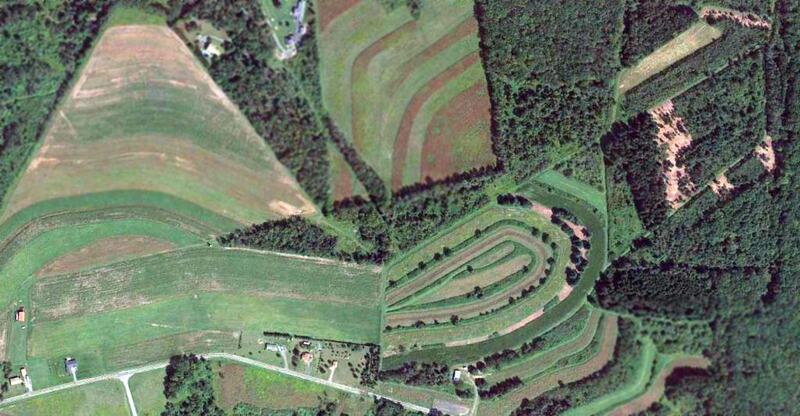 The ever-present bank barn on the north side of Route 222 is seen at upper-right image edge. The large trees that lined Rt. 222 sprout above the copter’s tail section. the same time as the main hangar, seen here with a checkerboard color scheme on the roof. 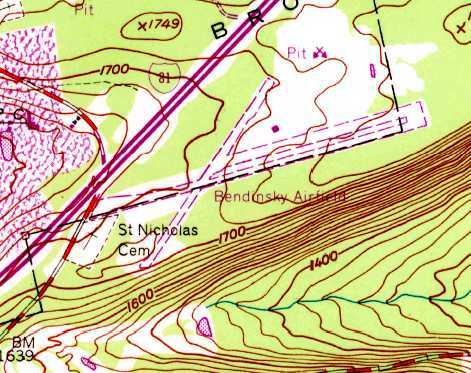 was on the 1957 USGS topo map (courtesy of Elwood Christ). It depicted 2 perpendicular unpaved runways, labeled simply as “Airfield”. 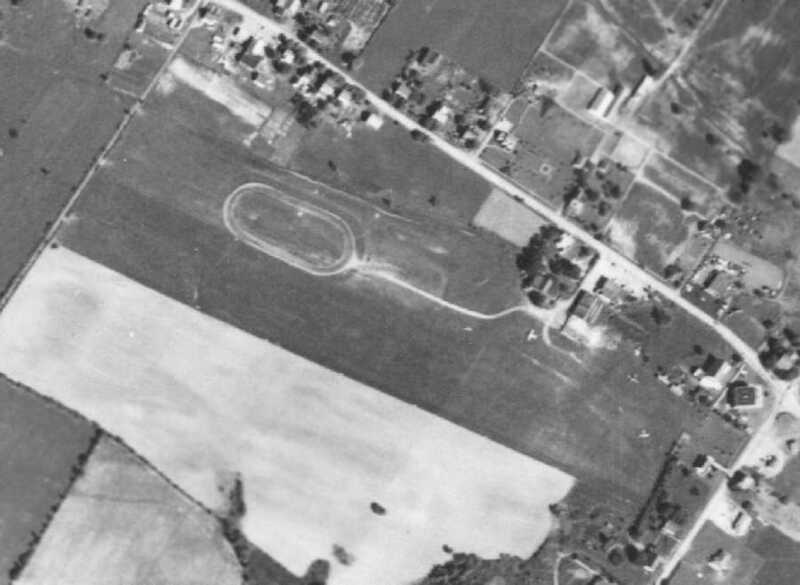 A 10/24/58 aerial view (from Penn Pilot) depicted Trexlertown Airport as having 2 grass runways, with a checkerboard-roofed hangar on the northwest side. Elwood Christ observed, “The runways are clearly seen. The main runway is oriented east/west, while the secondary strip runs NNE/SSW. The west end of the grass main runway broadens out to form a rectangular taxi area from the buildings. The white dots that appear along the main runway, I believe are runway lights that Pop had installed, though not all of them are visible. The other areas of this 42-acre tract were leased out to a local farmer. I always remember them being planted in alfalfa. The long light-colored structure toward the northwest corner of the airport property is a T-hangar that I believe could hold about 6-7 small aircraft. During the early 1950s, as people wanted to store their planes at Trexlertown, the main hangar filled up, thus the need for the T-hangar. They were made out of corrugated metal sheets attached to a steel frame. The structure with the checkerboard paint scheme is the main hangar, and attached to its north side is the service station garage. Attached to the hangar’s south side are the old office & the Christ family home. while the light rectangle above the hangar is the concrete pad marking the location of the service station gas pumps. 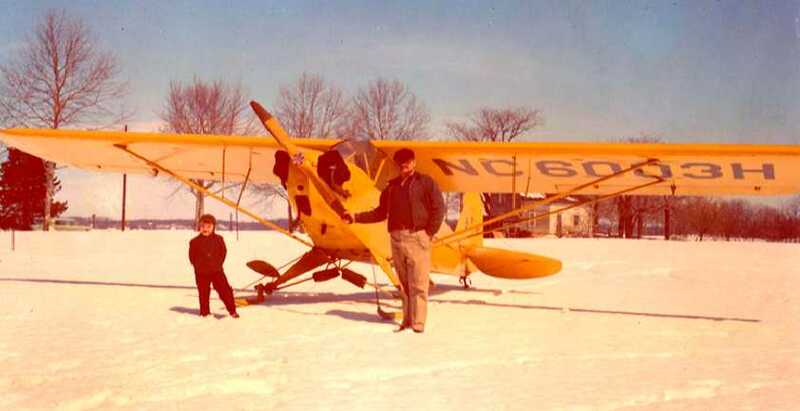 of Elwood Christ & Warren Christ in front of a ski-equipped Piper Cub NC6003H at a snowy Trexletown Airport. Elwood recalled, “My favorite picture of my father & I. Following a 6 inch snowfall, Pop & I went for a plane ride. This image, I think, was taken after that flight. The picture was shot in front of the main hangar looking northeasterly toward the tenant house. and is, or was, on display at the Henry Ford Museum in Dearborn, MI. Toward the early 1960s my father installed runway lights at Trexlertown. 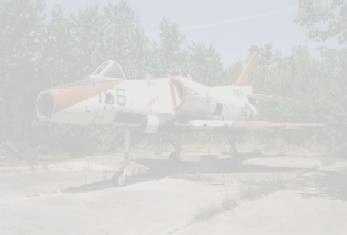 which depicted 2 single-engine aircraft parked near the hangar. was a circa 1963 photo of the Christ Aviation buildings & hangars in the snow (courtesy of Elwood Christ). Elwood recalled, “The view looks off Route 222 toward the southeast at the western-most driveway entrance to the service station. From left toward right we see the service station addition. Near the photo’s center is the west side of the main hangar. Very rarely do I remember this set of doors being opened. Elwood Christ recalled, “About or shortly after the [above 1963 photo], signs of the changing demographics became evident. Allentown had been growing & more & more people, who worked there, did not want to reside there; they looked for housing in the suburbs. private homes sprung up on parcels sold by the farmers along Route 222 & side roads. Then during the early 1960s, a developer purchased some farmland next to the airport on the south side of Church Lane. on which he started the 'Ancient Oak' housing development during the summer of 1963. Within 2 years, several of the development’s residents complained of some of the low-flying planes landing on the secondary runway. that it was nigh impossible for some of the more modern aircraft with longer takeoff runs to clear them. There was one non-fatal crash. I recall a newspaper image of a Cessna 150 or 172, nose down on Route 222. 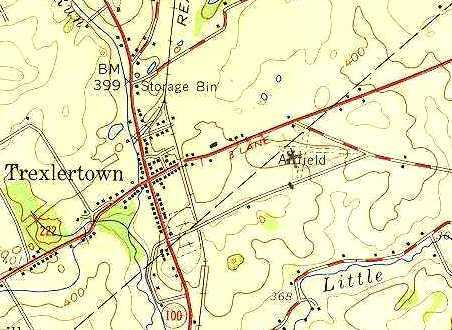 The 1964 USGS topo map depicted Trexlertown Airport as having 2 unpaved runways, with 2 small buildings on the northwest side. 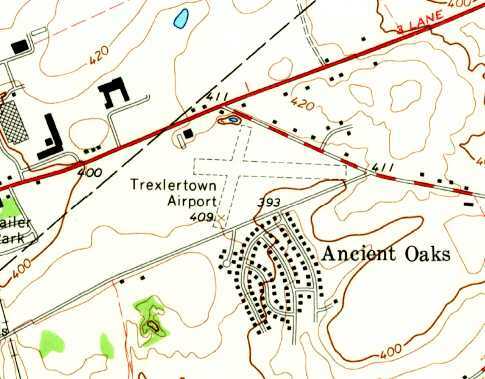 The last aeronautical chart depiction which has been located of Trexlertown Airport was on the 1964 NY Sectional Chart. It depicted Trexlertown Airport as having a 2,100' unpaved runway. and the people who based their planes at the Trexlertown Airport had either died or moved to other fields. According to Elwood, Trexlertown Airport closed in 1966. Elwood continued, “After the sale of the airport to a developer, I believe named Pincus, my father continued to live on the site. One of the disappointing events, though, for Pop was that the developer who purchased the airport grounds had died. As his estate was probated, I suspect Pop was permitted to reside here. 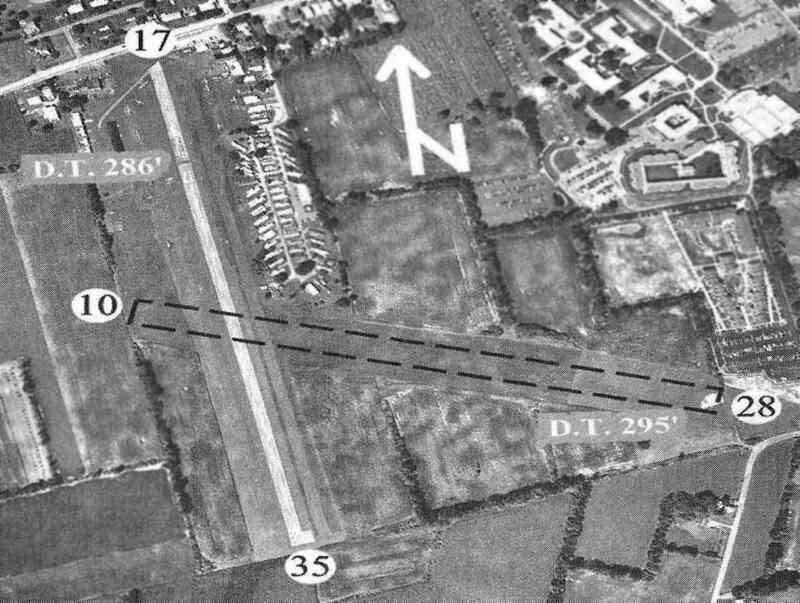 A 7/18/71 aerial photo showed that a north/south path had been cut across the runways, which otherwise remained intact. The hangar remained standing, but no planes were visible. with the site leveled in preparation for new construction. A 10/22/74 photo (courtesy of Elwood Christ) showed that the new Trexler Mall was up & running, leaving no trace of the former airport. 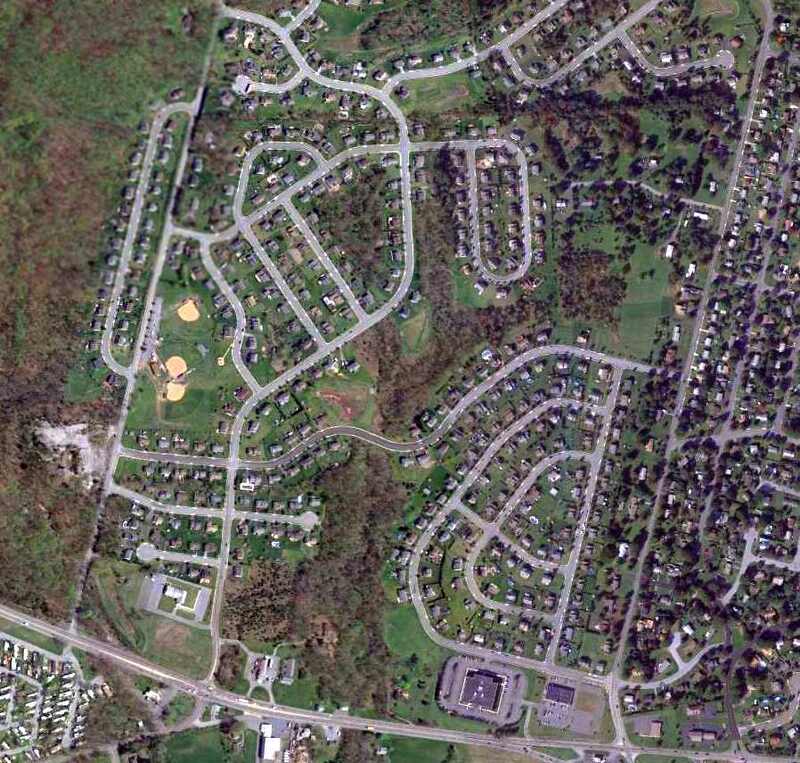 A 8/30/10 aerial view depicted no remaining trace of the former Trexlertown Airport. 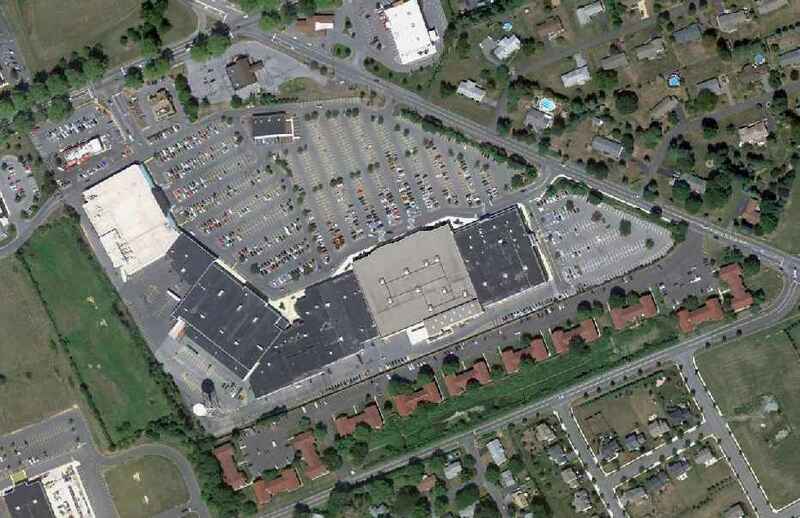 a mall, a McDonald’s and Friendly's Restaurants and the Trexlertown Post Office. 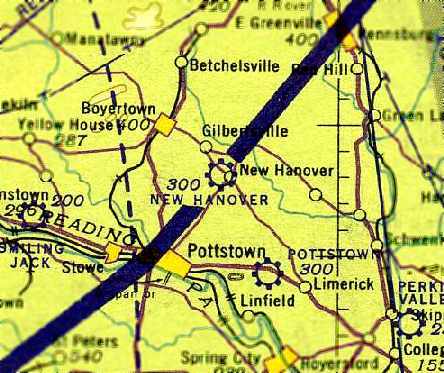 Kutztown Airport, as depicted on the July 1949 NY Sectional Chart (courtesy of Ron Plante). 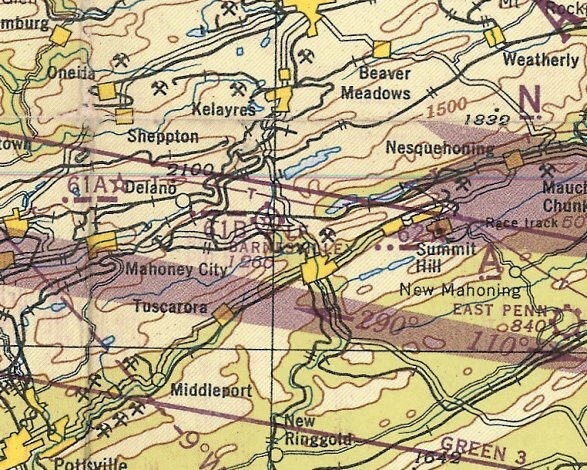 Kutztown Airport was not yet depicted on the January 1945 NY Sectional Chart (courtesy of Ron Plante). “World War II was over & the world could once again rest easy. 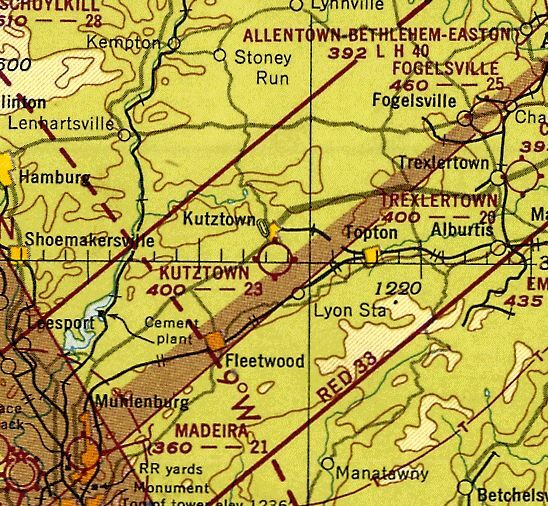 It was during this postwar period that Kutztown Airport was started. Two local businessmen caught 'the bug' for flying. Carl Bieber & Harold Miller earned their wings in Allentown. Avid flyers, they rented planes at Allentown. Without superhighways, travel time to the Allentown Airport seriously cut into flying time. 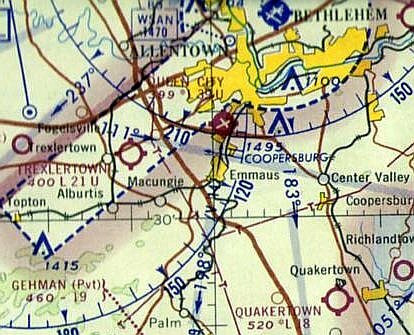 Occasionally, one pilot would drive to Allentown, fly home & land in a field on the east end of Kutztown. He'd pick up his buddy, and they share some piloting. The more the men flew, the more they hankered for an airfield closer to home. The Kutztown Airport website continued, “Carl & Harold found 2 investors: William Grim & Curvin Reichert. Thus, 4 local businessmen signed an agreement & bought the 90 acre Charles Angstadt farm. 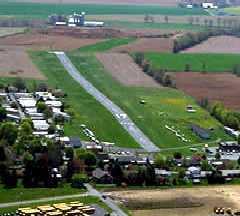 Construction of the Kutztown Airpark began: remodeling the barn as a hangar, runway preparation, purchase & transportation of a Trexlertown food stand to the Airpark. The food stand served as the Airpark office for several years until the existing office was built about 1960. The investors approached Fritz Bachman, manager of Berks Airport. Fritz agreed to a partnership which included managing the new airport. Diverse backgrounds in business helped their venture succeed. 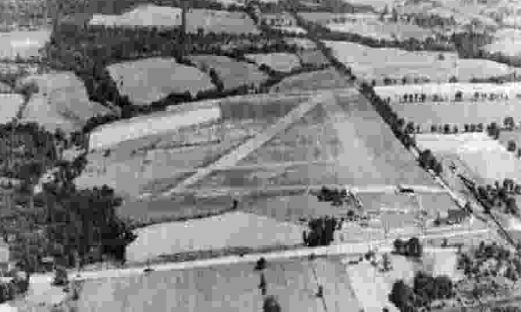 The Kutztown Airport website continued, “The Kutztown Airpark was officially opened 5/30/45 with Francis 'Fritz' Bachman as manager & instructor. The airport offered flight instruction, aircraft maintenance & repair, and entertainment. What is now the rear part of the main hangar served as both the hangar & maintenance shop. Mechanics jockeyed planes downhill onto a clay ramp to make room for repairs & maintenance. they slipped, slid, grunted & said few choice words until they accomplished the task. Airpark employees included Gus Spanier, Clarence Stein, and Alton Stein. Within the first year, the maintenance shop & pre-fab hangars were built. 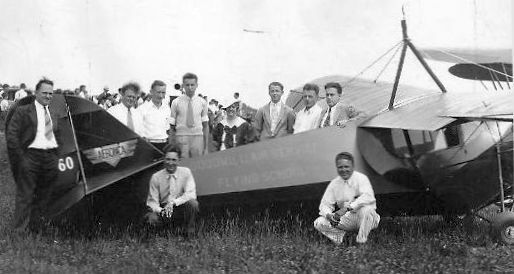 The Kutztown Airport website continued, “'Fun Days' were held to attract attention & build up business for the new airport. One of the challenges offered was A MOCK BOMBING RUN. The field was marked with an 'X'. Pilots carrying bags filled with flour or lime would aim for the targeted area & drop their bombs. Another attraction was fritz Bachman's aerobatic maneuvers in the Piper Cub. He'd finish his performance with a bow from the Cub. Has most impressive bow ended with the tail in the air & the prop in the clay. The Kutztown Airport website continued, “From 1946-50 most small airports were doing a booming business. By 1947 aviation in Kutztown was moving along well. Most students learning to fly were financed by the GI Bill. The airpark's 3 flight instructors were kept busy. By 1947, the cement block hangars, using a new nested design with cantilevered trusses, were built. 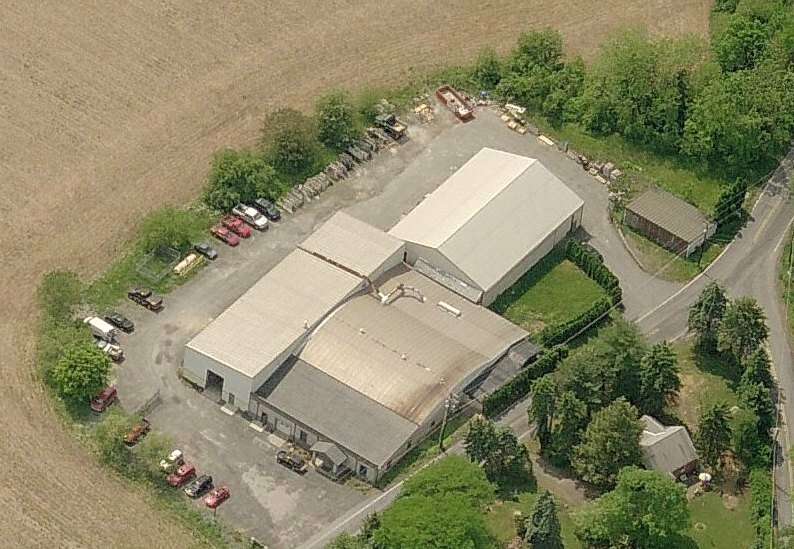 The Kutztown Airport website continued, “Merritt Smith, the newly hired A & P mechanic, worked the shop with Gus Spanier. They restored fabric-covered airplanes, repaired engines, did auto body work & painted cars. In 1950, they painted their first plane, a Cessna 170. Quality work & a word of mouth sold jobs. The shop grew to 9 people. and an Aero-Commander which went to France are well-remembered paint jobs. Over 4 years, 10 Supercubs (fish spotters) were recovered out of Lewes, DE. Kibbie DuPont was a customer for painting & upholstery. Advertisements in Trade-A-Plane mentioning a paint job by Kutztown helped make sales. The Kutztown Airport website continued, “Parachutes were packed at Kutztown from 1946-50. The tall section of the building behind the main hangar was the parachute loft. Parachutes were hung up there to dry while the long narrow section was used for packing the parachute. At that time, parachutes were made of silk & were required to opened & dried every 60 days. In those days, stalls & spins were requirements for earning a private pilot's license. Parachutes were required for these maneuvers. 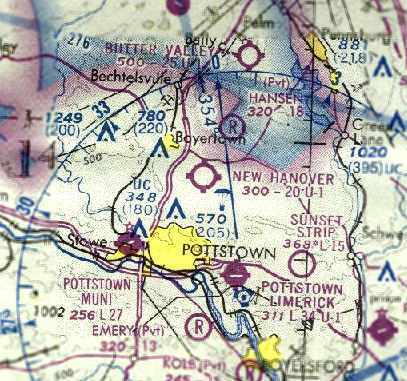 The earliest depiction which has been located of Kutztown Airport was on the July 1949 NY Sectional Chart (courtesy of Ron Plante). It depicted Kutztown as having a 2,300' unpaved runway. 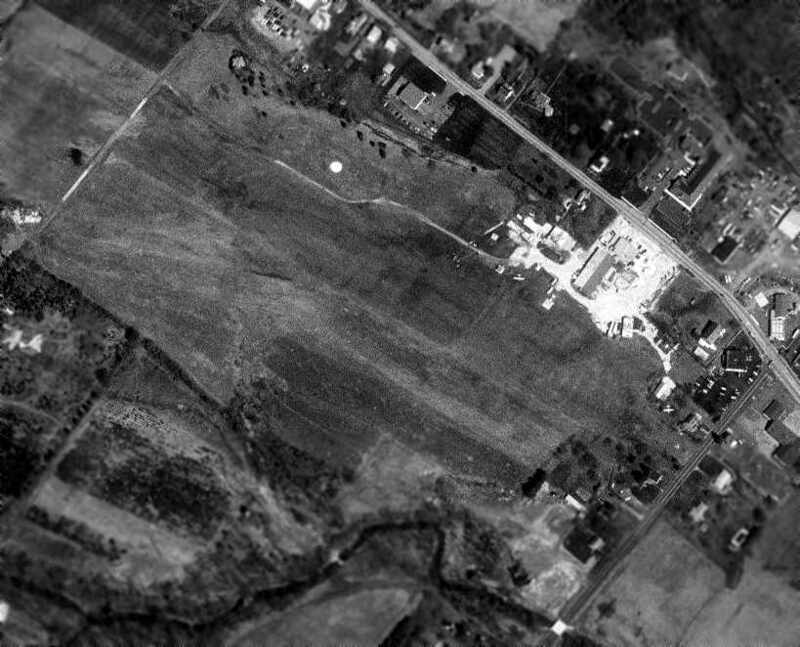 The earliest photo which has been located of Kutztown Airport was a 1951 aerial view. It showed the field as having 2 grass runways, with several T-hangars & 1 single-engine light plane on the northwest side. 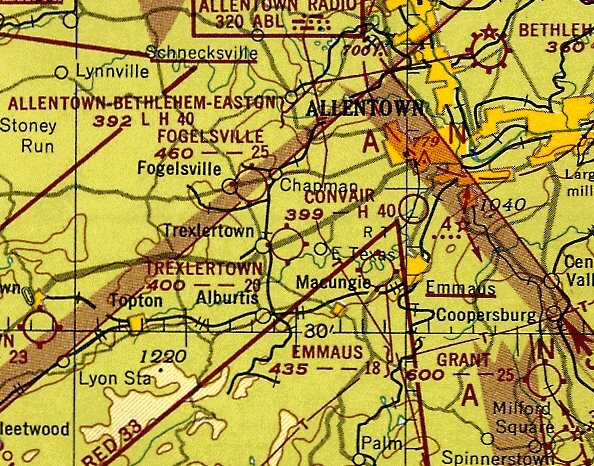 The 1956 USGS topo map depicted Kutztown Airport as having 2 unpaved runways. 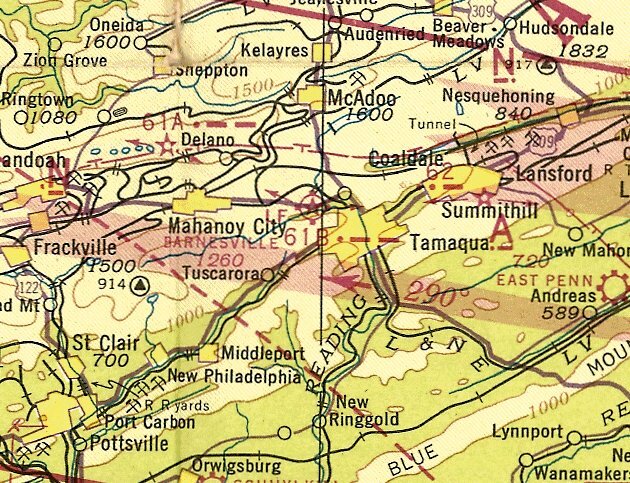 The 1957 NY Sectional Chart (courtesy of Mike Keefe) depicted Kutztown as having a 2,600' unpaved runway. with several T-hangars & 1 single-engine light plane on the northwest side. 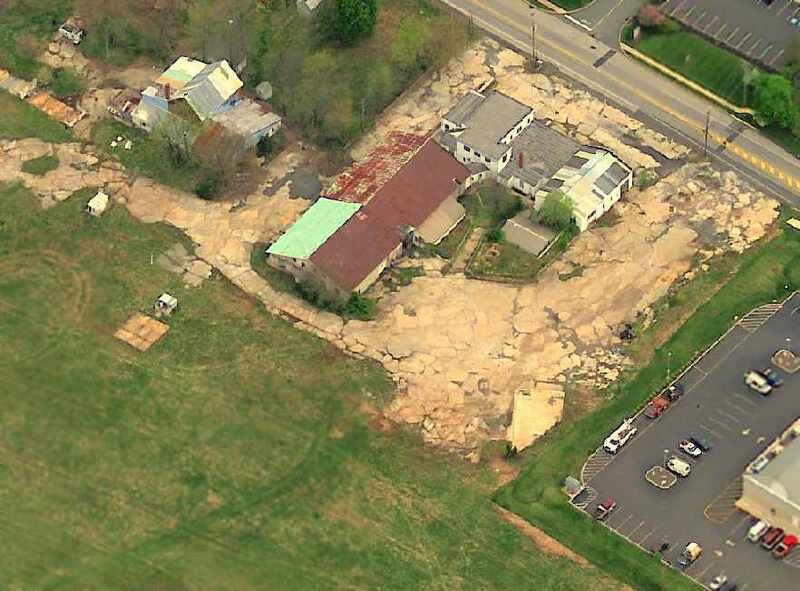 According to the Kutztown Airport website, “About 1959-60, the office building was replaced & Runway 17/35 was paved. For many years, Fritz advertised 'Learn to Fly $99.99.' The airport was also a dealer for Gulf fuel, Schweizer, and Cessna. In the summer of 1959, gliders arrived at Kutztown: a Schweizer 222 & 126. Fritz Bachman & Clarence Stein bought these from Reading Aviation. These gliders & the PA-18 Supercub towplane were the foundation of soaring at Kutztown. As the gliding business took off, enthusiasts started the Soaring Dutchmen Club. Many gliding competitions were entered. Schweizer 1-26 Regattas, assembly races, were held at Harris Hill. The point of assembly was 50 yards form the start line. A crew of 4 would race to the assembly area & assemble the glider. Officials would time the event from start to completion & inspect the finished product for airworthiness. The usual time was 7-8 minutes. Kutztown won 3 years in a row & their best time was 3:23 minutes. Other times of competitions were held for the time & distance. Gliders over Kutztown Airport were a familiar sight. 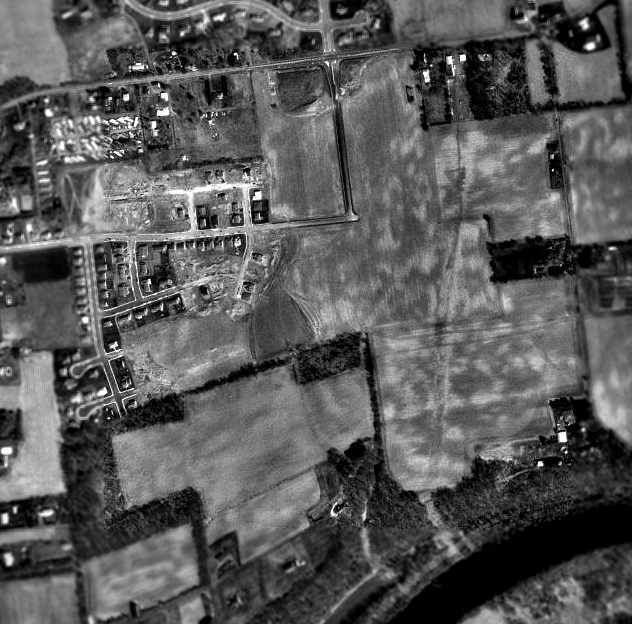 A 1962 aerial view depicted Kutztown in pretty much the same configuration as the 1958 photo. A total of 11 light aircraft were visible on the field. 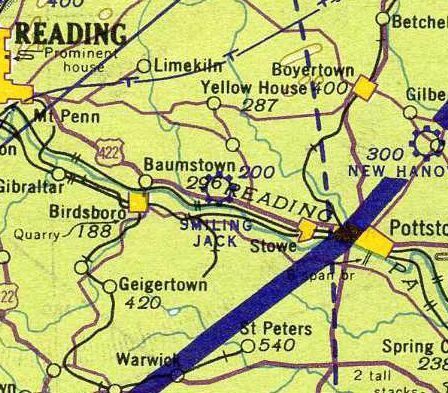 According to the Kutztown Airport website, “In 1965, Soaring Magazine's cover was a photograph of 3 gliders soaring in formation over Kutztown Airport. Each Schweizer 126 were piloted by Kutztown pilots: Dave Beltz, Luther Moyer, and Doc Yund. 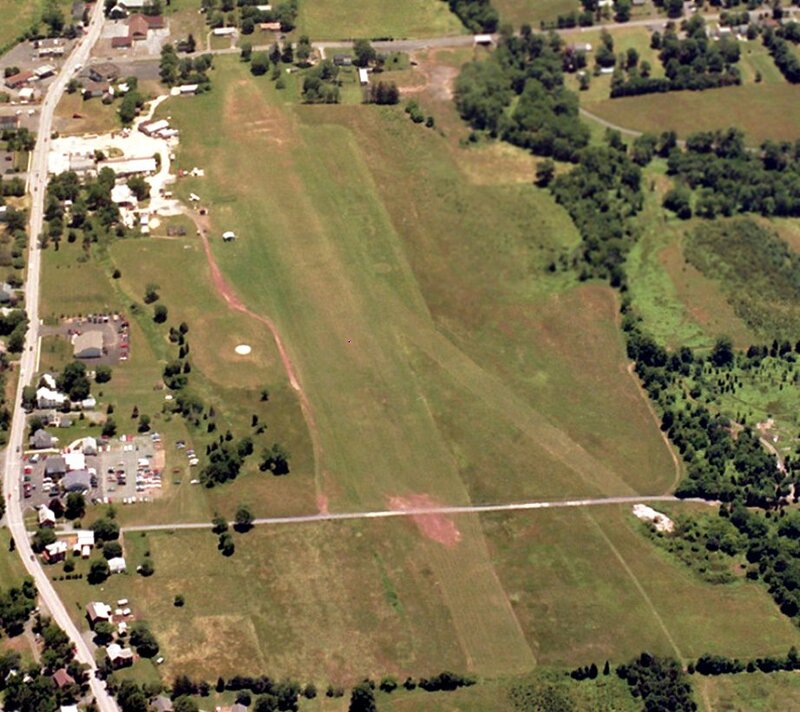 A 7/18/71 aerial photo showed Kutztown Airport as having a paved northwest/southeast runway & a grass crosswind strip. 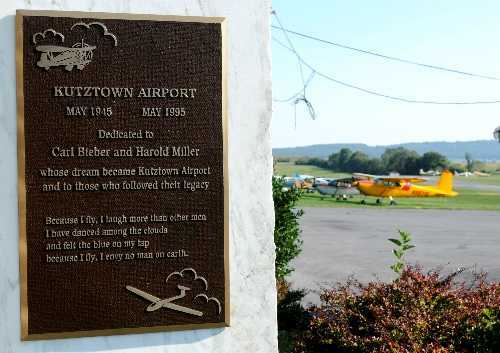 According to the Kutztown Airport website, “Fritz Bachman continued to operate the airport until 1977. At that time, Fred Clemens & Walt Sampson bought the aviation service. 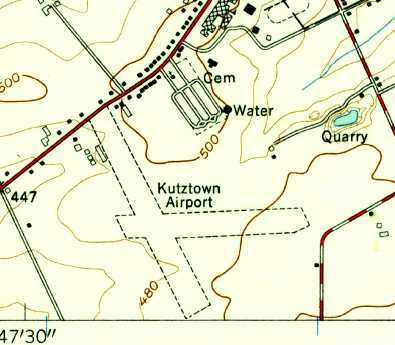 The 1983 PA Airport Directory depicted Kutztown Airport as having a 1,938' bituminous Runway 17/35 & a 2,068' turf Runway 9/27. Several hangars were depicted on the northwest & northeast sides of Runway 17. According to the Kutztown Airport website, “Earl Binder acquired the business in May 1993. Since then, roofs on the main hangar, office, and flight school have been repaired. even thought the primary runway had been paved for over 23 years at that point. commemorating the airport's 50th anniversary. 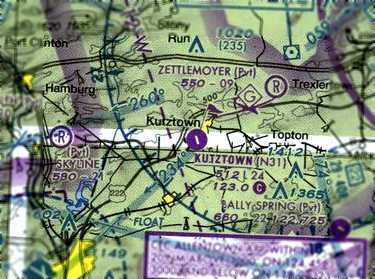 The Kutztown Airport website described in 2003, “Runway 10/28 (turf) remains active. Gliders continue to be a big attraction. Tows are available by our 2 Cessna 182s & a Waco. Kutztown Airport's power fleet consists of 5 Cessnas, a 150, a 152, a 172, two 182's, a Piper 140, and a Waco biplane. 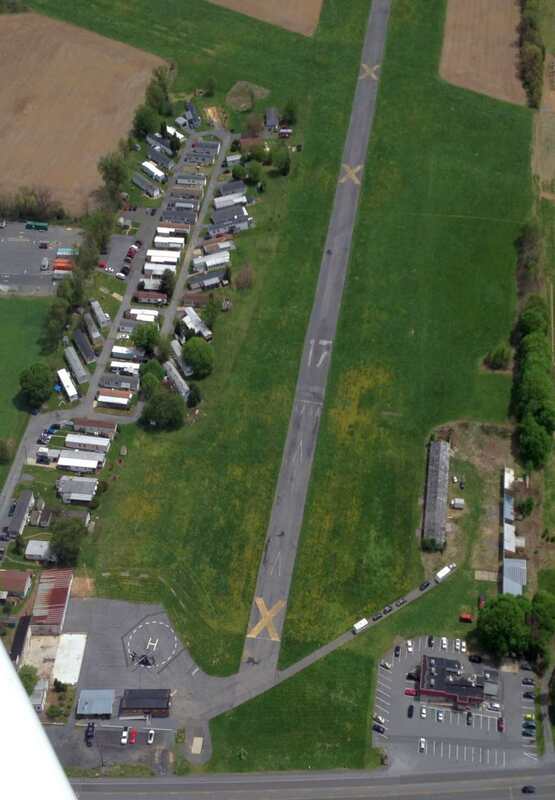 An April 2004 aerial view showed 4 gliders & 9 single-engine aircraft at Kutztown Airport. 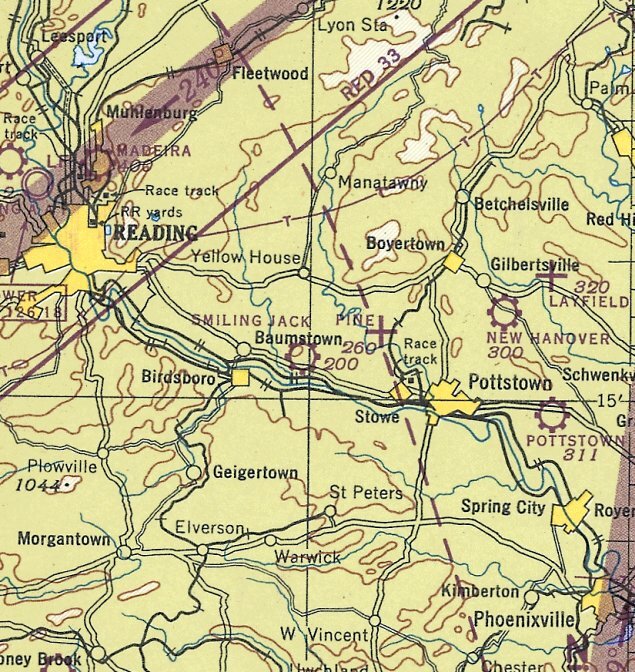 The last airport directory listing which has been located of Kutztown Airport was in the 2005 PA Airport Directory (courtesy of John Clifford). 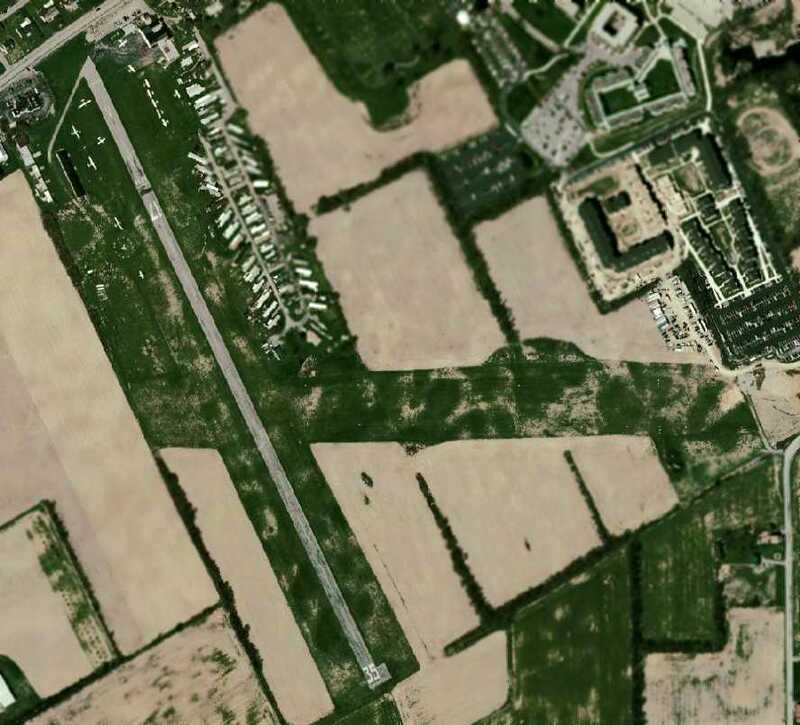 It described Kutztown as having a 2.460' concrete/turf Runway 17/35 & a 2,221' turf Runway 10/28. The manager was listed as Earl Binder. with gliders & single-engine aircraft parked on either side of the runway. A 11/23/07 photo by Daniel Berek of a Lehigh County Medical Center Sikorsky S-76 in front of the Kutztown Soaring School hangar. 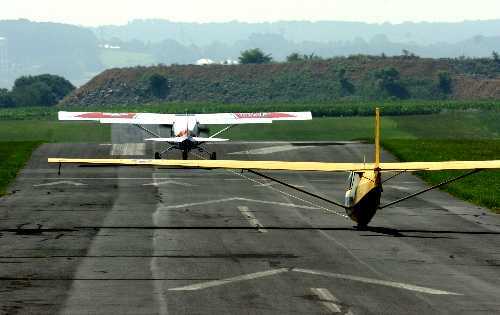 An undated photo from a 2008 article looking south as a Civil Air Patrol towplane pulls a glider along Kutztown's Runway 17.
was on the November 2008 NY Sectional Chart. Unfortunately a Notice To Airmen was published for Kutztown Airport in August 2008 that services & fuel were no longer available. attorney Joseph A. O'Keefe wrote that his clients have no interest in keeping it open. The letter does not name the owners, but Berks County records identify them as Nicholas Prikis & Sophie Pittas. and the owners are beginning the Federal Aviation Administration process of closing the airport. Owners anticipate that no planes will be allowed to land at Kutztown Airport after 1/31/09. Lehigh Valley Hospital has been instructed to remove its MedEvac helicopter within 30 days. Construction of a shopping center is anticipated on the property. and they would expect to be paid that much by Maxatawny if the township would decide to condemn the land for its own use. appeared in the 10/10/08 issue of the Reading Eagle. identified in county records as Nicholas Prikis & Sophie Pittas. attorney Joseph O'Keefe of Kutztown wrote. The Federal Aviation Administration requires a 30-day window to close an airstrip, he explained. and it's anticipated that a shopping center will be built on the 70-acre site. Maxatawny supervisors discussed the letter at a township meeting Wednesday night. Attempts to reach O'Keefe & Prikis for comment Thursday were unsuccessful. and they increased recently when a flight school there shut & auctioned its contents. "I'm saddened because it's been a part of the community for 50 or 60 years," Supervisor Allen Leiby said. "I'm not in favor of it becoming a shopping center." Maxatawny resident Marc Nadeau & his wife, Theresa, have operated the Kutztown Skydiving Center at the airport for 6 years. "I just wish that the landowner understood aviation & had an appreciation for aviation," Marc Nadeau said. "This is a place to live the dreams of flight. I'm sure everybody has dreamt of flying." had not been notified of a Kutztown Airport closure, FAA spokeswoman Arlene Salac said. unless the township granted a conditional-use permit for another purpose. The property is zoned as a mix of commercial & light-industrial use. O'Keefe contends that by rezoning the parcel, the township would essentially be taking control of the land by regulation. saying a shopping center would require a conditional-use permit under existing & proposed zoning. According to O'Keefe, the airport has operated at a loss for more than 25 years. to remove its medical helicopter from Kutztown Airport surprised hospital officials Thursday. The deadline was mentioned in an 10/6/08 letter Kutztown attorney Joseph O'Keefe sent Maxatawny Township on behalf of the airport owners. said hospital officials were aware that the airport could close but that they had not been informed of specifics. The MedEvac 1 station based at the Kutztown Airport is the hospital's only station in Berks County. The helicopter responds to medical emergencies, flying seriously ill or injured victims to the hospital near Allentown. A Notice To Airmen was published for Kutztown Airport in December 2008 that the airport was closed to transient aircraft. Marlin Fausey reported in 2008, “What a shame this airport is closing. showing the pronounced hump along the runway. Kutztown Airport was owned by Kutztown Enterprises, with the manager listed as Earl Binder. 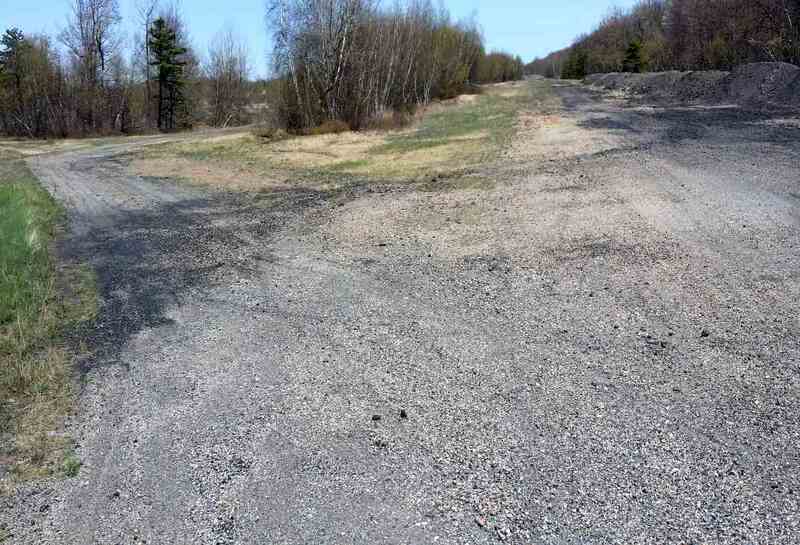 The field was said to have a 2,460 asphalt Runway 17/35 & a 2,221' turf Runway 10/28. A total of 40 aircraft were based on the field, including 4 gliders & 11 ultralights. The field was said to conduct an average of 121 takeoffs or landings per day. Jim Gratton reported in 2009, “The Fixed-Base Operator was auctioned off last fall. and the allegation now is they are going to be putting a mall in it's place (a mall!, in this economy). The airport had a thriving FBO that did glider training & gave rides in a beautiful red Stearman biplane. There is a restaurant on the field that you could park your aircraft directly in front of. The airport was long known for it's tricky runway, with 2 very large dips which caught your attention upon arrival. Also, parachute ops were standard operating procedure adjacent to the pattern, adding to the excitement of any arrival there. An October 18, 2009 photo by Jim Scott looking northeast along Kutztown's runway, showing the prominent closed-runway symboles. 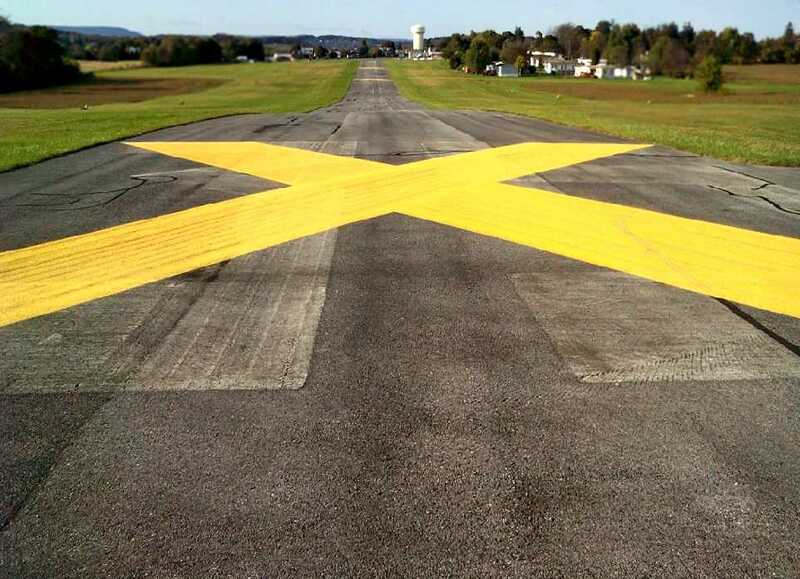 although it took all summer, crews finally crossed out the runway & painted-over the numbers. A med-evac helicopter service is still working at the main hangar, and the grass fields & crosswind runway were mowed all summer. The handful of runway lights still were turned on each evening until recently. The local CAP group camped out & did glider flights this summer too. A 5/11/14 aerial view by Paul Freeman looking south at Kutztown Airport, showing the medevac helicopter which remains at the closed airport. 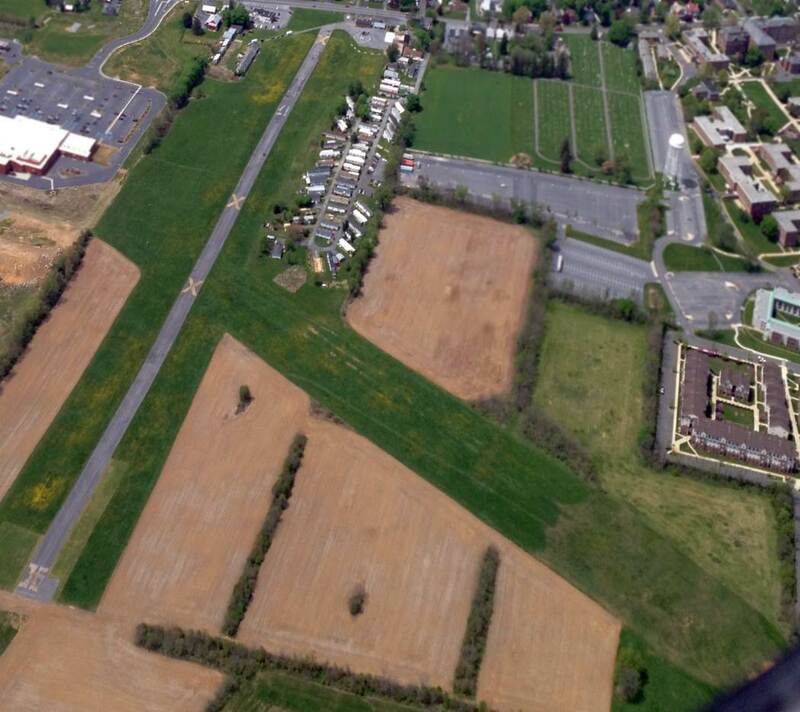 A 5/11/14 aerial view by Paul Freeman looking north at Kutztown Airport, showing the 2 runways which remain intact. 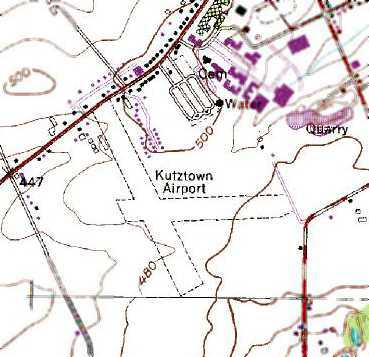 Kutztown Airport is located south of the intersection of Kutztown Road & Luckenhill Road. Thanks to Jim Gratton for pointing out the closure of this airport. 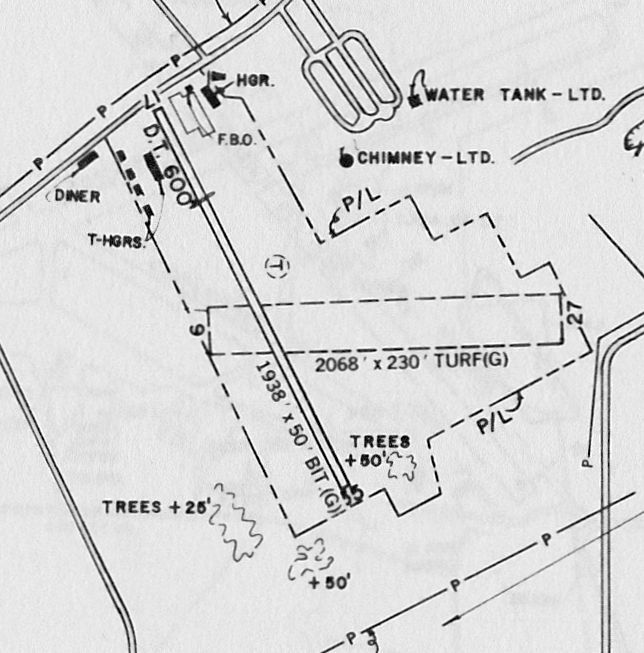 New Hanover Airport, as depicted on the May 1943 NY Sectional Chart (courtesy of Chris Kennedy). Note that the airport was located right under the western boundary of the wartime "Vital Defense Area" that extended to the coast. as it was not depicted at all on the March 1942 NY Sectional Chart (according to Chris Kennedy). was on the May 1943 NY Sectional Chart (courtesy of Chris Kennedy). It depicted New Hanover as a commercial/municipal airport. described New Hanover as a civilian airport having a 2,500' unpaved runway. depicted New Hanover as a commercial/municipal airport. as a 58 acre irregularly-shaped property within which were 2 sod runways, measuring 2,450' northwest/southeast & 2,000' east/west. depicted New Hanover Airport as having a 2,100' unpaved runway. depicted New Hanover Airport as having a 1,900' unpaved runway. 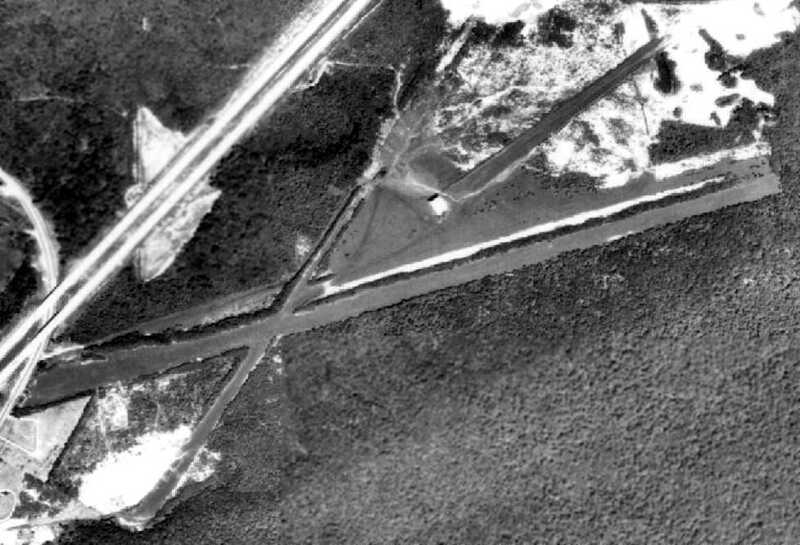 The earliest photo which has been located of the New Hanover Airport was an October 4, 1957 aerial view (from Penn Pilot). 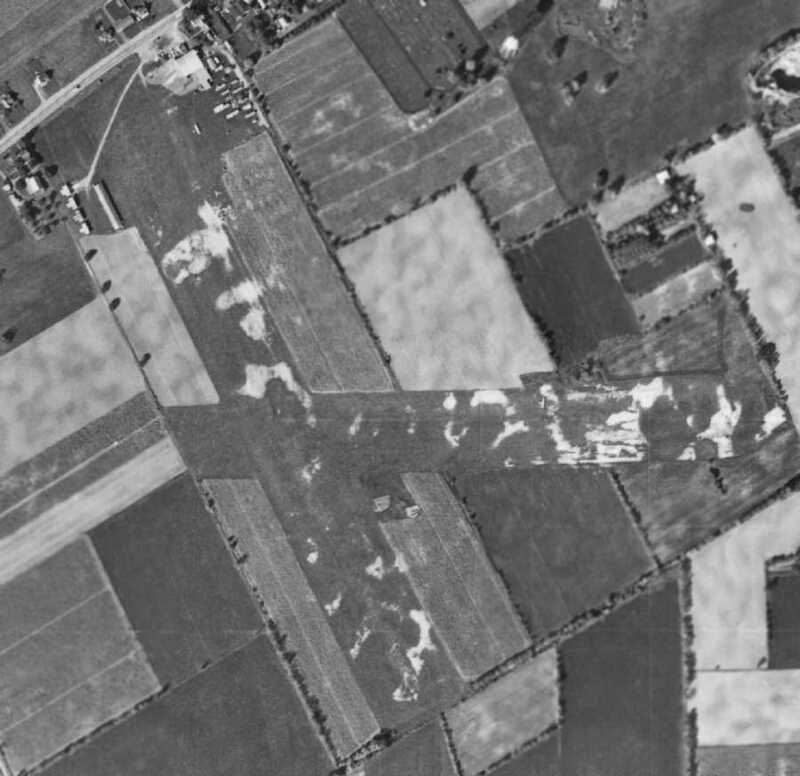 with several buildings & 2 light aircraft visible parked on the east side of the field. all depicted New Hanover Airport as having a 1,900' unpaved runway. Richard Finley recalled, “A month after I bought the C150 (5/29/70), I had taken a Saturday to go punch holes in the sky. I landed at several airports & one of them was New Hanover. I went there because the Sectional Chart indicated they had an active [parachute] drop zone. I had my Para Commander with me. I got on a lift & jumped with them. I did not stay for more than one lift. Their rules of conduct were different that the ones we practiced at Alliance Sport Parachute Club (Salem, OH). ASPC had been in continuous existence since 1959 without a single fatality or serious injury. At ASPC, we had beer at the hangar but it was kept in a locked refrigerator & the fridge could not be unlocked until the airplanes were put away. with at least 2 light aircraft visible parked on the east side of the field. and indicated that parachuting operations were conducted. as having a 2,455' turf Runway 13/31 & a 1,490' turf Runway 11/29. and parachuting within a 2 mile radius. and the 'Herd Boogie' (a skydiving festival). I jumped there several times throughout my skydiving career, and had many good times there. Dan Morris recalled, “New Hanover Airport - I flew from this airport. with several buildings (hangars?) on the northeast side of the field. 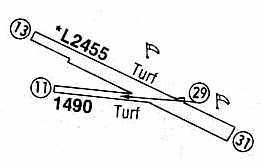 The 1997 PA Airport Directory (courtesy of John Clifford) depicted New Hanover Airport as having 2 turf runways: 2,455' Runway 13/31 & 1,490' Runway 11/29. The licensee was listed as the Charles Heinly Estate, the manager as Mary Kaas, and the Fixed Base Operator as United Parachute Club. at least 2 light single-engine aircraft were visible on the northeast side of the New Hanover Airport. The last photo which has been located showing aircraft at New Hanover Airport was a 7/12/00 aerial view looking southwest (from the Dallin Aerial Survey Collection, courtesy of the Hagley Museum & Library). It depicted at least 1 small single-engine plane parked next to the runway. Timothy Miller reported in 2006, “The airport was closed several years ago. as a circa 2001 aerial photo showed that no planes were visible on the field anymore, although the runways remained intact. obviously in a state of abandonment. A 7/25/07 photo of the buildings at the site of New Hanover Airport. 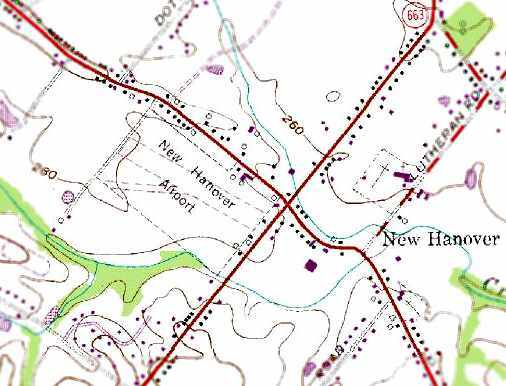 The site of the New Hanover Airport is located on the west corner of Swamp Pike & North Charlotte Street. 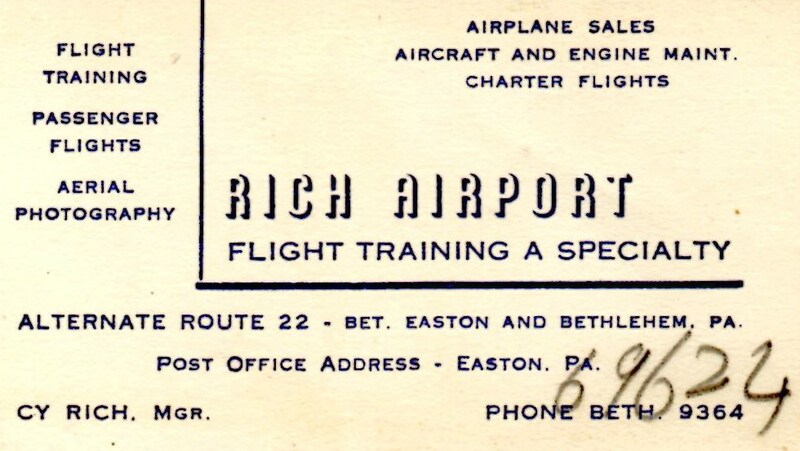 A circa 1940-42 business card for Rich Airport (courtesy of John Givre). 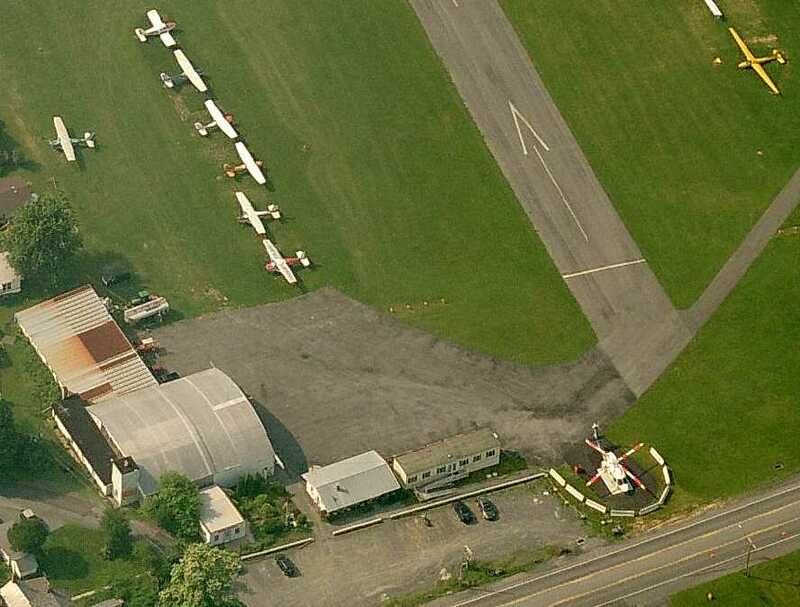 This small general aviation airport was located in between the towns of Bethlehem & Easton. The earliest reference which has been located of Rich Airport was a business card found by John Givre in his father's papers. and got his pilot's license in April 1942, so maybe Rich was operating as early as 1940. The earliest depiction of Rich Airport which has been located was on the November 1942 NY Sectional Chart (courtesy of Ron Plante). It depicted “Rich” as a commercial/municipal airport. Rich Airport was still depicted on the 1944 NY Sectional Chart (courtesy of Chris Kennedy). as that is how it was listed in the 1945 Haire Publishing Company Airport Directory (courtesy of Chris Kennedy). It was evidently renamed after its owner, operator, and manager - Buck Woodward. within which were 3 sod runways, with the longest being a 2,700' northeast/southwest strip. and to offer repairs, charter, storage, training, and fuel. 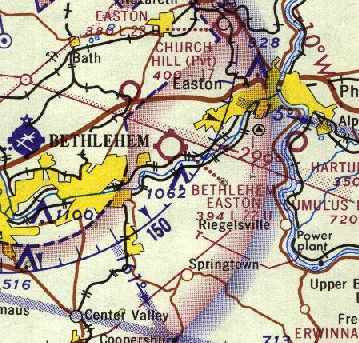 No airfield in Bethlehem or Easton was listed among active airfields in the 1945 AAF Airfield Directory (courtesy of Scott Murdock). depicted Buckwood as a commercial/municipal airport. 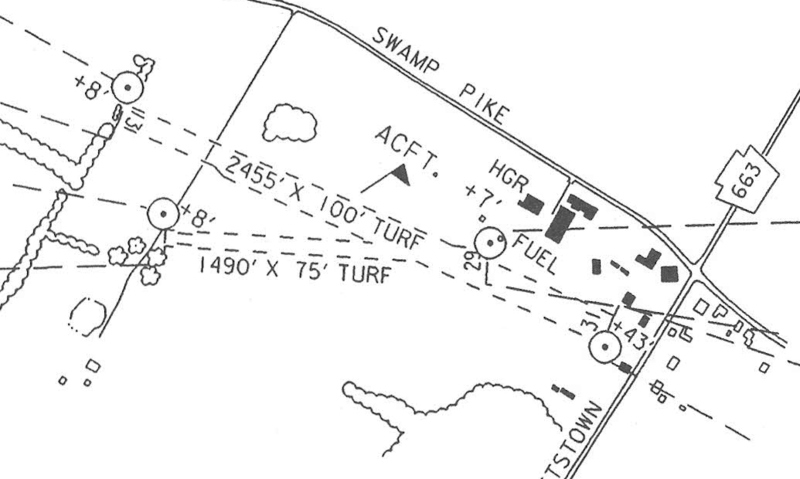 The 1947 USGS topo map depicted the airfield as Buckwood. as that is how it was labeled on the January 1949 NY Sectional Chart (courtesy of Chris Kennedy). It was depicted as having a 2,700' unpaved runway. but it was labeled simply as “Airfield”. 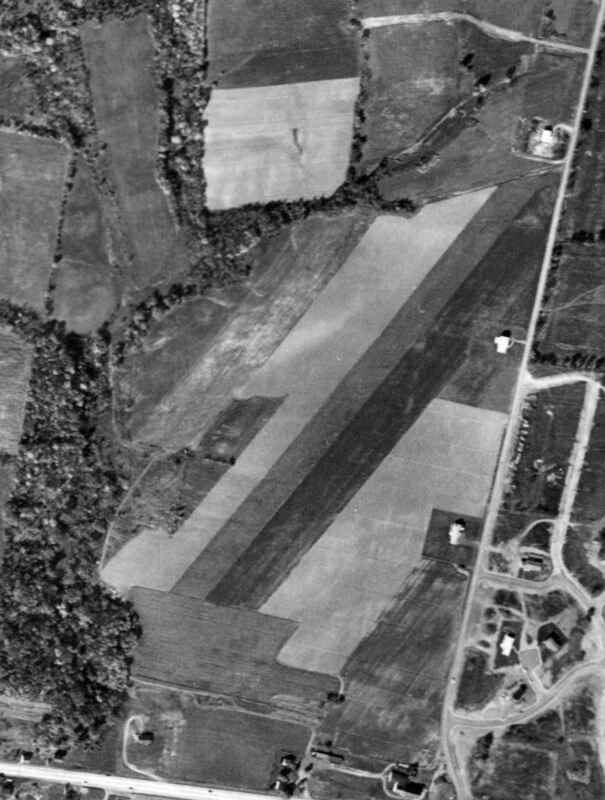 The earliest photo which has been located of the Bethlehem-Easton Airport was an October 16, 1958 aerial view (from Penn Pilot). with several buildings & 1 light aircraft visible on the north side of the field. 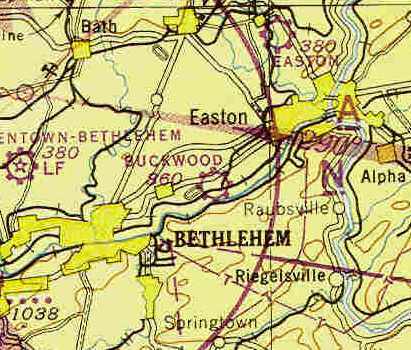 A 1962 aerial view depicted Bethlehem-Easton in pretty much the same configuration as the 1958 photo. A total of 3 light aircraft were visible on the field, including one on the east/west runway. 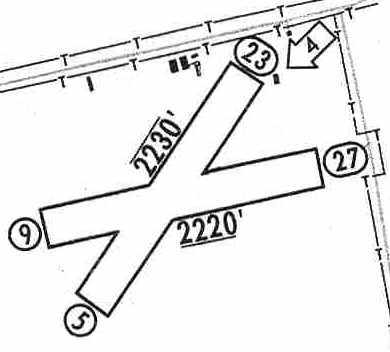 The 1962 AOPA Airport Directory described Bethlehem-Easton as having 2 sod runways: 2,641' Runway 9/27 & 2,330' Runway 4/22. The field was said to offer fuel, repairs, hangars, tiedowns, and charter. The operator was listed as Eugene Trigiani (a Cessna dealer). 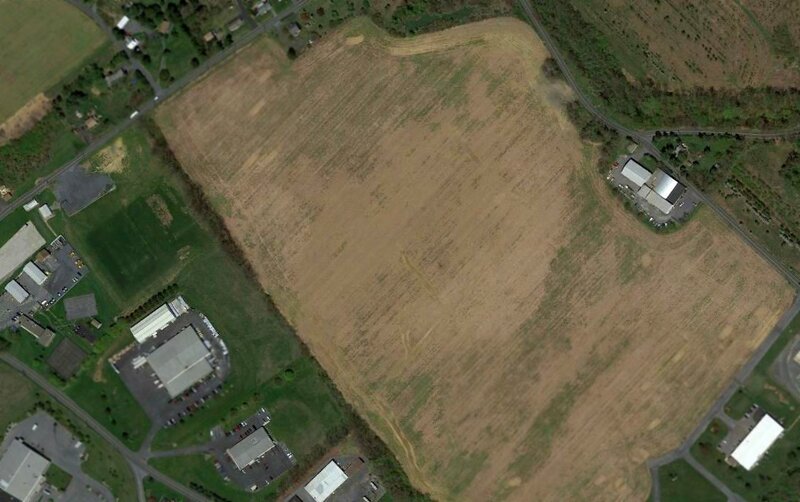 depicted Bethlehem Easton Airport as having 2 turf runways: 2,230' Runway 5/23 & 2,220' Runway 9/27. A few buildings were depicted on the north side of the field. The manager was listed as Roger Laviolette. 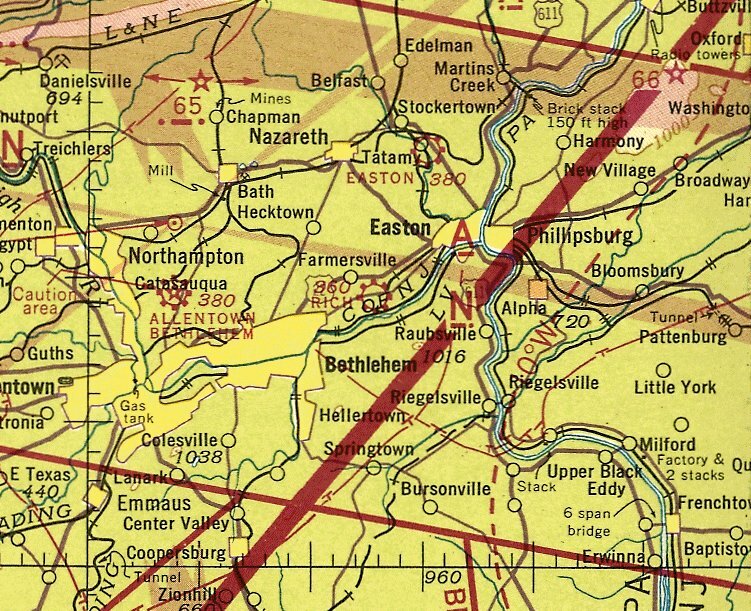 The 1966 AOPA Airport Directory (according to Tom Beamer) Bethlehem-Easton as having 2 runways: 2,330' Runway 5/23 & 2,200' Runway 9/27. The operator was listed as Lehigh Aircraft. According to Tom Beamer, Lehigh Aircraft had been the Fixed Base Operator at nearby Allentown Bethlehem Easton Airport. It depicted the field as having a 2,200' unpaved runway. A local resident recalled, “There were 2 prominent metal arched hangars along the road (Freemansburg Avenue) when you drove by the site. this probably occurred in 1967-68.
as it was no longer depicted at all on the 1969 USGS topo map. A 7/15/71 aerial photo did not show any obvious signs of current use of the Bethlehem Easton Airport. The former grass runways were no longer evident, although the overall area remained clear. but there was no sign of any aircraft. by the time I moved to Bethlehem in 1972 & the runways could have been realigned. By the 1970s there was only one runway. The last owner was Bill Shannon & he kept it open as a private airport after the noted closure date. as it was no longer depicted at all on the January 1973 NY Sectional Chart (courtesy of Ron Plante). before it was developed with housing, with the 2 metal arched-roof hangars visible at the top-center of the photo. The building to the left may have been the former airport administration building. 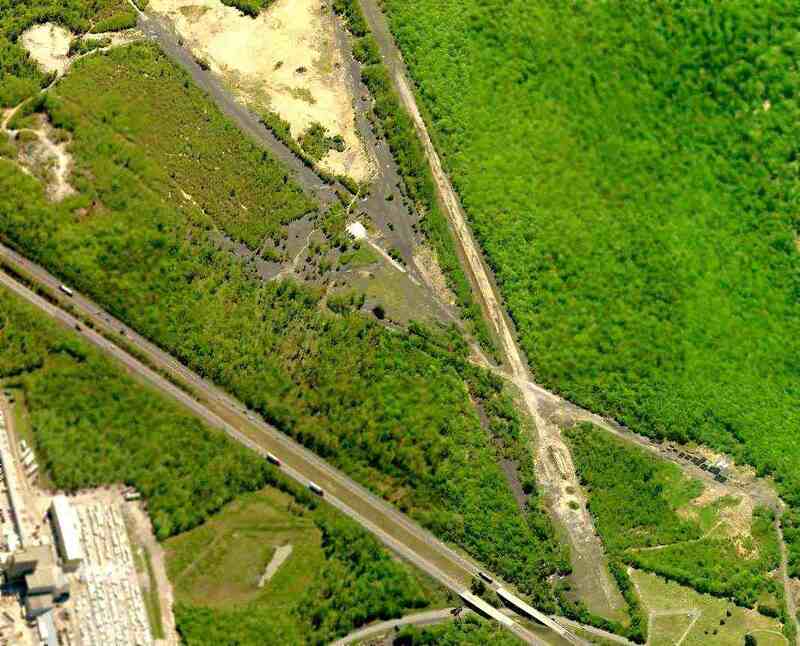 the faint outline of both the former east/west & northeast/southwest runways at the site of the former Bethlehem Easton Airport were still recognizable. 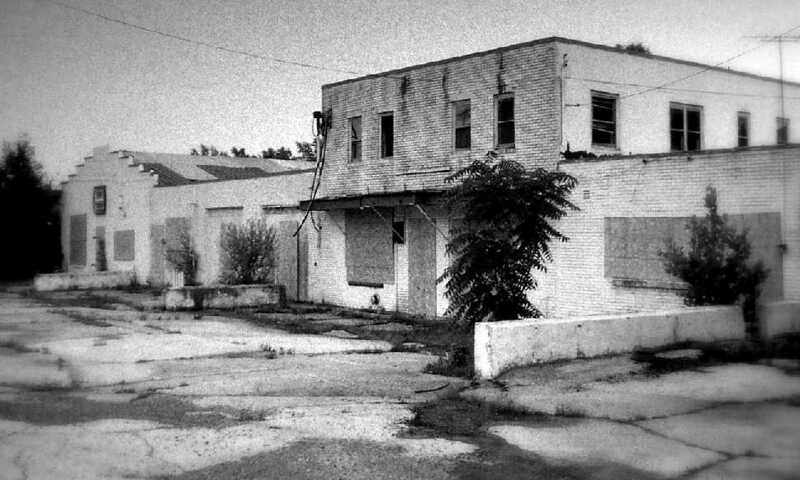 The former administration / shop building & hangar had been removed at some point between 1993-99. 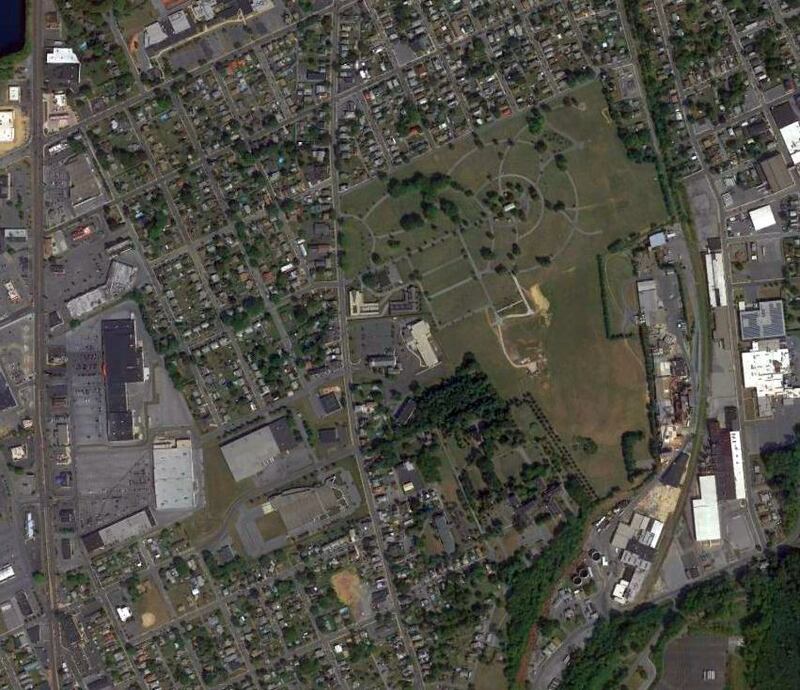 The site of Bethlehem Easton Airport is located south of the intersection of Freemansburg Avenue & North Wagner Drive. Thanks to Kevin Peterson for pointing out this airfield.